There is an old business saying that "...any organisation is only as good as its people" and Duncan & Fraser were no exception. In July 1922 they employed 337 people rising to just over 460 people at their height just a couple of years later. A few employees would go on to have a profound impact on the automotive industry not only in Adelaide but for all of Australia. The fervour of the Great War enticed 65 men in the employ of Duncan & Fraser Ltd. to volunteer and fight for "King and Country". The company kept each and every position open upon their return, sadly some never returned to take up the offer. This was the second time Duncan & Fraser made this offer, the previous time was during the Boer War (1899-1902). Adcock, Miss - listed on the organising committee for the 1921 picnic. Alford, H.E. - birthday listed at 22nd September in the September 1922 issue of "The Echo". Allen, J. - listed as a competitor in the "Three-legged Race", "Bowser Boat Race", "Ford Sheffield Handicap" and other events at the 1922 & 1923 picnics. Allnut, Miss I.D. - working in the Ford Sales Office she is listed as a competitor in the 50 yds "Ladies' Championship" running race at the 1922 & 1923 picnics. Her birthday was on the 14th September. Almond, H. - working in the Body Shop he is listed as a competitor in the "Mile End Obstacle Race", "Light Square High Jump", "21st February 1923 Flag Relay Race" and other events at the 1921, 1922 & 1923 picnics. Amos, C.H. - his birthday is listed as 26th January in the January 1923 "The Echo". Anderson, Miss - listed as a competitor in the 50 yds "Ladies' Championship" running race at the 1921 picnic. Angus, C.T. - listed as a competitor in the "Kicking For Goal" at the 1922 picnic. He is also listed as a competitor in the "Fifty-Nine Three-legged Race" at the 1923 picnic. Whether he is related to G. Angus (below) is not known. Angus, George - working in the Costing Dept. he is listed as a competitor in the "Mile End Obstacle Race", "Light Square High Jump" and other events at the 1921 picnic & the "Hanson Street Boot Race at the 1923 picnic. Around October 1924 he undertook a trip of the Yorke Peninsula with a Studebaker '6'. Covering 700 miles he averaged 22 mpg without even a puncture. Whether he is related to C.T. Angus (above) is not known. Antonio, Hedley - joined Duncan & Fraser Ltd. as a driver in 1915. Hedley's happy nature endeared him to his colleagues and customers alike rising to the postion of Garage Manager. Together with Workshop Foreman George Mason they saw 280 cars through the garage in a single day during "show Week" in 1922. Hedley is also listed on the Executive Committee of the Social Club in 1921, 1922 & 1923, but was said to be "devastated" when George Mason resigned to set up his own Ford service garage. Hedley also enjoyed a day out shooting. Antonio, L.C.V. - possibly related to H. Antonio above, his birthday on the 19th February is mentioned in the February 1923 "The Echo". Armes, T. - his birthday is listed as 29th February in the February 1924 "The Echo". Ashton, Miss N.B. - joined the company in February 1916 starting in the offices in the Accounts Dept. She partnered Miss T. Dawson in the "Ladies Double Championship" and also H. Pope in the "Thornycroft Mixed Doubles" tennis at the 1921 & 1923 picnics. Remembered for her "cheerful and obliging disposition", she resigned in October 1924 to get married. Attwood, A. - his birthday is listed as 14th February in the February 1924 "The Echo". Axford, William J. - working as a carpenter when he enlisted on 4th February 1915 to fight in the war. His position was kept open when he returned to Australia on 31st March 1919. He is listed as a competitor in the "Three-legged Race", "Duncan & Fraser Championship", Centipede Race" and other events at the 1921 picnic by which time he was now working in the Body Shop. Bahr, W. - listed as a competitor in the "Three-legged Race", "Kicking For Goal" and other events at the 1921 picnic. Baker, Frank Edward - was employed as a painter when he enlisted on 4th January 1916. His position was kept open for when he returned to Australia in 1919. Whether he is related to W. Baker (below) is not known. Baker, W.H. - listed as a competitor in the 135 yds "Ford Sheffield Handicap" running race at the 1921 picnic. Whether he is related to Frank baker (above) is not known. Baldock, L.G. - listed on the organising committee for the 1923 & 1924 picnics. Whether he is related to W. Baldock (below) is not known. Baldock, W. - his birthday on 11th February is mentioned in the January 1923 "The Echo". Whether he is related to L. Baldock (above) is not known. Bamford, C.S. - listed as a competitor in the "Light Square High Jump" at the 1921 picnic. Later listed as a competitor in the 100 yds "Associated Companies' Championship" at the 1923 picnic. Bandt, Lew Thornley - started in 1924 as an apprentice body designer. Due to Ford making their own bodies Lew Bandt left Duncan & Fraser Ltd. in 1926 for Tarrant's in Melbourne in a deal brokered by the Duncans so he could finish his apprenticeship. He joined Ford Australia in 1928 and went onto design the utility in 1933, a world first. He retired from Ford in 1975. In 1987 he was filming documentary for the Australian Broadcasting Commission. After he'd finished filming he set off back to his home in Geelong and had a head-on crash with a large gravel truck. Lew died from the injuries sustained in the crash. Paradoxically, Lew was driving his 1933 Ford V8 Ute at the time of the crash. Banfield, F. - his birthday on 14th December is mentioned in the December 1924 "The Echo". Banton, A.E. - whether he is related to T.E. Banton (below) is unknown, but an A. Banton is listed as a competitor in the "Three-legged Race" and the "Centipede Race" at both the 1921 & 1922 picnics. His birthday on 26th February is mentioned in the February 1923 "The Echo". Whether he is related to T. Banton (below) is not known. Barbour, P. - joined when he was appointed Public Officer on 9th February 1921 filling the legal vacancy created when Fred Mann resigned as Company Secretary in late 1920. Initially part of the Executive Committee for the Social Club, however his name does not appear in this capacity beyond the 1921 picnic. After less than 18 months with the business he resigned in August 1922 taking up the position as Director & General Manager for Vivian Lewis Ltd.
Barclay, N. - his birthday on 20th June is mentioned in the May 1923 "The Echo". Barker, John Mortimer - was employed as a mechanic when enlisted on 17th September 1914 to fight in the war. His position was kept open when he returned to Australia on 4th June 1919. Working once more in the Motor Shop John is listed as a competitor in the "Relay Race" at the 1921 picnic. Barnes, C.H. - listed in the April 1924 "The Echo". Barrett, Ray - worked in the Motor Shop and is mentioned in the November 1924 "The Echo". Barrington A. - listed as a competitor in the "Fordson High Jump", "Bowser Boat Race" and other events at the 1922 picnic.His birthday was on the 21st June. Barron, C. - working in the Body Shop he is listed as a competitor in the "Three-legged Race", "Kicking For Goal", Centipede Race" and other events at the 1921 - 1923 picnics. His birthday was the 24th September. Baseby, Miss E. - partnered W. Parlor in the "Thornycroft Mixed Doubles" tennis and competed in the 50 yds "Waymouth Street Ladies' Championship" at the 1923 picnic. Her birthday was on the 21st January. Battye, F. - working as an oxy-welder in the Sheet Metal Department he is listed as a competitor in the "Mile End Obstacle Race", Hanson Street Boot Race" and other events at the 1923 picnic. Baxter, A.B. - joined Duncan & Fraser Ltd. selling Studebaker cars in November 1922 with a L.R. Baxter. Whether he is related to H. or L. Baxter (below) is unknown. Baxter, H. - listed as a competitor in the "Mile-End Obstacle Race", "Fifty-Nine Three-legged Race" and other events at the 1923 picnic. Whether he is related to A. Baxter (above) or L. Baxter (below) is not known. Baxter, L.R - joined Duncan & Fraser Ltd selling Studebaker cars in November 1922. He won the "Travellers' Race" at the 1924 picnic. Whether he is related to A. or H. Baxter (above) is not known. Behrens, Hubert Albert "Johnnie" - formerly trained as an engineer, Johnnie Behrens joined Duncan & Fraser in 1909 as a Ford salesman & mechanic. He resigned 3 years later in 1912 to form his own company Behrens & Marshall specialising in the sales and service of Ford cars at Flinders Street, Adelaide. Ross Theim, another Duncan & Fraser employee would follow 12 months later. Behrens & Marshall was an dynamic company and soon became the largest Urban Ford Dealer in South Australia second only to Duncan & Fraser Ltd. and later Duncan Motors Ltd. Behrens & Marshall was another of the many dealerships interviewed when French arrived in January 1924 and were also highly critical of Duncan Motors Ltd. as the sole distributors selling Ford cars both wholesale and retail. They even offered to take on the Ford distributorship if French decided to take it away from the Duncan brothers! The Duncans response to this was revoking their Urban Ford Dealership status immediately after French left. Behrens & Marshall still trade today as Maughan Theim Ford at Cheltenham (a suburb of Adelaide) outlasting Duncan & Fraser Ltd. by decades. Bell, R. - working in the Motor Shop he is listed as a competitor in the "Centipede Race" at the 1921 & 1922 picnics. Whether he is related to T. Bell (below) is not known. Bell, T.H. - listed in the October 1924 "The Echo". His birthday was the 10th October. Whether he is related to R. Bell (above) is not known. Bellman, Royce - joined Duncan & Fraser as an apprentice motor mechanic in 1910 aged 14. He left in late 1914 possibly before completing his apprenticeship to enlist in the army to fight in the war. Bennett, L.H. - his birthday on 7th October is mentioned in the September 1923 "The Echo". Bergstrom, V. - listed as a competitor in the "Three-legged Race", "Bowser Boat Race" and other events at the 1922 picnic. Betteridge, Allan Rupert - enlisted on 14th October 1915 joining the Australian Flying Corps to fight in the war. His position was kept open when he returned to Australia on 4th March 1919. Allan is listed as a competitor in the "Three-legged Race" at the 1922 picnic. His birthday was the 11th October. Berry, H.A. - working in the Stores he is listed as a competitor in the "Three-legged Race", "Bowser Boat Race" and other events at the 1921 & 1922 picnics. His birthday was the 12th October. Whether he was related to the very large and well known food importing company Henry Berry's that were also situated in Franklin Street is not known. Binks, Joseph William Ernest - working as a labourer when he enlisted on 31st May 1915 to fight in the war. His position was kept open when he returned to Australia on 21st December 1917. Whether his wounds stopped him from taking up his position is unknown. Birch, A.K. - his birthday on 9th March is mentioned in the February 1924 "The Echo". Bishop, Clement - was employed as a coach builder when he enlisted on 1st June 1916 to fight in the war. His position kept open when he returned to Australia on 18th July 1919. Clem is listed as a competitor in the "Relay Race" at the 1923 picnic where he still worked in the Body Shop. His birthday on 22nd December is mentioned in the December 1923 & again later December 1924 "The Echo". Clement was a younger brother of Reg Bishop (below). Bishop, J.H. - working in the Garage he is listed as a competitor in the "Relay Race", Centipede Race" and other events at the 1922 & 1923 picnics. His birthday was the 2nd October. It is not known if he is related to Clement Bishop (above) or Reg Bishop (below). Bishop, Lindon Reginald "Reg" - was a clerk when he enlisted 9th December 1914 to fight in the war. His position was kept open when he returned to Australia on 25th January 1919. Reg is the older brother to Clement Bishop (above). He is listed as a competitor in the "Fordson High Jump", "Bowser Boat Race" and other events at the 1922 picnic. Blackwell, E.J. - his birthday on 6th June is mentioned in the May 1923 "The Echo". Blakely, J.C. - working for Duncan Motors Ltd. and part of the Ford Sales Staff he is listed on the organising committee for the 1923 & 1924 picnics. In April 1924 he was promoted to Ford District Organiser where he travelled extensively to various dealers assisting them with their sales and prospect systems. Blakley, C.J. - resigned his post as Ford 1-ton Truck Salesman at Duncan Motors Ltd. in January 1923 citing "...going into the land business". Boakes, L. - working in the Motor Shop he is listed as a competitor in the "Bowser Boat Race", "Relay Race" and other events at the 1921 & 1922 picnics. His birthday was on the 5th November. Bond, Albert George "Bert" - joined his father George Bond (below) aged 14 at Bond's Bus Tours in 1910. He joined Duncan & Fraser at some stage after this where he worked on engines, probably as an apprentice. He is listed in Duncan & Fraser Ltd.'s "Honour Roll" as an employee that enlisted for military service. Bert enlisted on 17th May 1915 to fight in the war and was wounded late in the Gallipoli campaign. After hospitalisation in Egypt he joined the 1st Australian Flying Corps in October 1916 based in France as an aircraft mechanic. The "Red Baron" was shot down on 21st April 1918 near Amiens where he crash landed in "No Mans Land". Under German machine gun fire, Bert crawled out across the open area, tied a rope around the tail of the fuselage and crawled back to his lines. They carefully pulled the wreckage about 50 yards towards the Australian trenches where Baron Von Richthofen's body could be removed in relative safety. Bert survived the war and returned to Australia on 6th May 1919 where he rejoined Bond's Bus Tours. See the Duncan Family page for more details. Bond, Eric - partnered W.F. Parlour in the "Studebaker Gents Double" tennis and competed in the "21st February 1923 Flag Relay Race" at the 1923 picnic. The 1923 picnic program lists Eric as working in the Body Shop. Bond, George Ford - married Ellen Jessie Duncan, the oldest daughter of James Duncan in 1887. Although exact details are sketchy, it is thought that he may have commenced work for his father-in-law at Duncan & Fraser around 1907, perhaps even earlier. However, in 1910 he left and joined his son Bert that had set up Bond's Bus Tours at Clare in South Australia with an Argyll 12-seater "Char-a-banc". A year later, 4 new Fords were purchased to accommodate the rapidly expanding business. It is believed that James Duncan financially assisted his daughter and grandson with the formation of the company. George was killed on 14th September 1918 when he was struck by a car whilst riding his bicycle. His sons carried on the business. By December 1969 Bond's Bus Tours had carried over 10 million passengers. Bond, R. - listed in the August 1924 "The Echo". Whether he is related to the Bond family (above) is not known. Bowen, Charles Hamilton - was working as a mechanic in the garage when he enlisted on 6th June 1918 to fight in the war. His position kept open when he returned to Australia on 28th August 1919. Bowering, R. - his birthday on 23rd October is mentioned in the September 1923 "The Echo". Bowey, L.A. - listed as a competitor in the "Three-legged Race", "Bowser Boat Race" and other events at the 1922 picnic. His birthday on 18th December is mentioned in the December 1924 "The Echo". Whether he is related to S. Bowey (below) is not known. Bowey, S. - listed as a competitor in the 100 yds "Associated Companies' Championship" running race at the 1922 picnic. Whether he is related to L. Bowey (above) is not known. Bowrey S.A. - listed as a competitor in the "Fordson High Jump", "Ford Sheffield Handicap" and other events at the 1922 picnic. Boyle, Miss E.J. - listed as a competitor in the 50 yds "Ladies' Championship" running race at the 1921 - 1923 picnics. Her birthday was on the 6th September. She resigned from the company in May 1924 to get married. Bradey, C. - listed in the October 1924 "The Echo". Bradley, C. - listed as a competitor in the "Mile End Obstacle Race", "Hanson Street Boot Race" and partnered F.E. Nice in the "Studebaker Gents Double" tennis at the 1923 picnic. Whether he is related to L. Bradley or Miss Bradley (below) is not known. Bradley, L. - his birthday on 25th December is mentioned in the December 1924 "The Echo". Whether he is related to C. Bradley (above) or Miss Bradley (below) is not known. Bradley, Miss E.V. - joined Duncan & Fraser Ltd. in late 1917. She is listed as a competitor in the 50 yds "Ladies' Championship" running race both the 1921 & 1922 picnics. Whether she is related to C. Bradley or L. Bradley (above) is not known. She left the company in September 1923 to get married. Hugh Duncan presented her with a clock and a salad bowl on behalf of the company and the employees. Brady, A. - working in the Garage he is listed as a competitor in the "Centipede Race" at the 1922 picnic. His birthday was the 13th October. Briggs, C. - his birthday on 4th October is mentioned in the December 1922 "The Echo". Briscoe, A.R. - working in the Garage he is listed as a competitor in the "21st February 1923 Flag Relay Race", "Fifty-Nine Three-legged Race" and other events at the 1923 picnic. His birthday was on the 6th March. Whether he is related to F. Briscoe or M. Briscoe (below) is not known. Briscoe, F.C. - his birthday on 15th December is mentioned in the December 1924 "The Echo". Whether he is related to A. Briscoe Frank (above) or M. Briscoe (below) is not known. Briscoe, M. - listed as a competitor in the "Hanson Street Boot Race" at the 1923 picnic. Whether he is related to A. Briscoe or F. Briscoe (above) is not known. Brodie, K. - his birthday is listed as 20th February in the February 1924 "The Echo". Brook, George James - was working as a mechanic in the garage when he enlisted on 12th October 1916 to fight in the war. His position was kept open when he returned to Australia on 1st February 1918. Whether his wounds stopped him from taking up his position is unknown. Brookes, E.S. - listed in the August 1924 "The Echo". Brown, A.M. - his birthday on 21st October is mentioned in the September 1923 "The Echo". Brown, C. - his birthday on 14th November is mentioned in the November 1924 "The Echo". Whether he is related to G. Brown or H. Brown (below) is not known. Brown, G. - from the Mill area he is listed as a competitor in the "Three-legged Race", "Bowser Boat Race" and other events at the 1922 picnic. Whether he is related to C. Brown (above) or H. Brown (below) is not known. Brown, H. - listed in the August 1924 "The Echo" as a lorry driver for the company. Whether he is related to C. Brown or G. Brown (above) is not known. Bruce, H. - listed as a competitor in the "Mile End Obstacle Race", "Hanson Street Boot Race" and other events at the 1921, 1922 & 1923 picnics. Brunt, Miss N. - her birthday on 28th November is mentioned in the November 1924 "The Echo". Bryant, T.G. - his birthday on 3rd October is mentioned in the September 1923 "The Echo". Budd, M.G. - joined the Studebaker Sales Staff at Duncan & Fraser Ltd. in September 1924. Burman, F. - his birthday on 9th January is mentioned in the December 1924 "The Echo". Burns, Miss - listed as a competitor in the 50 yds "Ladies' Championship" running race at the 1921, 1922 & 1923 picnics. Bushell, E. - listed in the April 1924 "The Echo". Butter, S. - listed as a competitor in the 135 yds "Ford Sheffield Handicap" running race at the 1921 picnic. Butterworth, Miss - listed as a competitor in the 50 yds "Ladies' Championship" running race at the 1922 picnic. Her birthday on 16th February is mentioned in the February 1923 "The Echo". Byass, P. - listed as a competitor in the "Hanson Street Boot Race", "21st february 1923 Flag Relay Race" and other events at the 1923 picnic. Worked in the Stores. Byrne, H.J. - joined Duncan & Fraser Ltd. as the Company Secretary on 27th November 1922 taking over from H.N. Perriam. He partnered Miss Hamilton in the "Thornycroft Mixed Doubles" and E. Scott Inglis in the "Studebaker Gents Double" tennis at the 1923 picnic. He was also Executive Committee of the Social Club in 1923 & 1924. The February 1924 "The Echo" makes mention that he passed his exams and obtained his Diploma from the Federal Institute of Accountants. He would remain as the Company Secretary until the firms closure in August 1927 when he was retrenched with the rest of the staff. Cadd, Percival Robert - was working as a coach builder when he enlisted on 30th June 1916 to fight in the war. His position was kept open when he returned to Australia on 27th July 1917. His wounds did not stop him from taking up his position in the Body Shop. He is listed as a competitor in the "Kicking For Goal" and other events at the 1921 - 1923 picnics. His birthday on the 28th December is mentioned in the December 1922 issue of "The Echo". Callier, E.P. - working in the Stores he is listed as a competitor in the "Three-legged Race", "Relay Race" and other events at the 1921 & 1922 picnics. He also partnered C. Johns in the "Studebaker Gents Double" tennis and competed in the "21st February 1923 Flag Relay Race" at the 1923 picnic. Calvesbert, H. - his birthday on 2nd October is mentioned in the September 1923 "The Echo". Cameron, J. - working as trimmer in the Body Shop, he is listed in the "Centipede Race" at the 1921 picnic. Whether he is related to N. Cameron (below) is not known. Cameron, N. - was appointed to the postion of Sales Manager for Duncan & Fraser Ltd. in January 1923 selling Studebakers & Standards. He is listed as being on the Executive Committee for the Social Club in 1923 & 1924. Whether he is related to J. Cameron (above) is not known. Campbell, J.W. - listed as a competitor in the "Ford Sheffield Handicap" at the 1923 picnic. His birthday on the 8th January is mentioned in the December 1922 issue of "The Echo".Whether he is related to K. Campbell, Miss M. Campbell or R. Campbell (above) is not known. Campbell, K. - working in the Garage he is listed as a competitor in the "Three-legged Race", "Relay Race" and other events at the 1922 & 1923 picnics. His birthday was on the 19th June. Whether he is related to J. Campbell (above) or Miss Campbell & R. Campbell (below) is not known. Campbell, M. - his birthday on 22nd October is mentioned in the September 1923 "The Echo". Whether he is related to any of the other Campbell's is not known. Campbell, Miss M.P. - partnered Miss E. Harris playing tennis "Ladies Double Championship" at the 1922 picnic. She later partnered E. Potter in the "Thornycroft Mixed Doubles" tennis at the 1923 picnic. Her birthday was on the 27th February. She left the Ford Sales Staff at Duncan Motors Ltd. in November 1922 to reside with her family in Victoria where it is believed that she took up a postion with Tarrant Motors Ltd., the Victorian Ford distributors. On her leaving she was presented with "xylonite brush, comb & mirror on behalf of the sales staff." Miss R. Rath was appointed as her replacement. Whether she is related to J. & K. Campbell (above) or R. Campbell (below) is not known. Campbell, R. - working in the Trim Shop he is listed as a competitor in the "Mile End Obstacle Race", "Hanson Street Boot Race" and other events at the 1923 picnic. Whether he is related to J. Campbell, K. Campbell or Miss Campbell (above) is not known. Canty C.R. - working in the Motor Shop he is listed as a competitor in the "Fordson High Jump", "Bowser Boat Race" and other events at the 1921, 1922 & 1923 picnics. His birthday was on the 16th September. Carey, S. - listed as a competitor in the "Mile End Obstacle Race", "Hanson Street Boot Race" and other events at the 1923 picnic. Carmody, Arthur - entered in the "Three-legged Race", "Bowser Boat Race" and other events at the 1921 - 1924 picnics. Arthur was the Body Building Foreman for Studebaker & Ford 3-seater bodies at the time of the fire in 1923. Carver, Alfred Edward James - was working cleaning cars when he enlisted on 4th November 1915 to fight in the war. His position was kept open when he returned to Australia on 11th May 1919. Cassebohm, H. - his birthday on 30th December is mentioned in the December 1924 "The Echo". Chase, H.E. - working in Sales he is listed as a competitor in the "Relay Race" at the 1922 picnic. He was promoted to Ford Salesman selling Ford cars in September 1922. Cheney, Sydney Albert - joined in 1903 as South Australia's first car salesman. By 1907 he was the Head Sales Manager. When the company was offered to public subscription in 1912 the Duncan brothers denied him a directorship. He left the business in 1914 to pursue the Dodge car agency setting up Cheney Motor Co. and later Holden Motor Bodies. Cheney wrote his autobiography "From Horse to Horsepower" in 1965. See S.A. Cheney's page at this site. Cherry, A.J. - working in the Sheet Metal Shop he is listed as a competitor in the "Bowser Boat Race", "Relay Race" and other events at the 1922 picnic. He shared his birthday on the 11th March with grandson Hugh Duncan. Childs, S. - working in the Mill area he is listed as a competitor in the "Three-legged Race", "Bowser Boat Race" and other events at the 1922 picnic. Chorley, J. - listed as a competitor in the "Ford Sheffield Handicap" at the 1923 picnic. Whether he is related toT. Chorley (below) is not known. Chorley, T. - working in the Stores he is listed as a competitor in the "21st February 1923 Flag Relay Race", "Fifty-Nine Three-legged Race" and other events at the 1923 picnic. Whether he is related to J. Chorley (above) is not known. Christie, C. - his birthday on 6th December is mentioned in the November 1924 "The Echo". Cleveland, N.G. - joined around 1907 in the car accessory side of the business. Rising to a manager's level, he left in 1917 for Cheney Motors managing their accessories for Dodge products. By November 1919 he had moved to Bagot, Shakes & Lewis, agents for International Lorries as their Accessories Manager. Cochrane, P. - working in the Body Shop he is listed as a competitor in the "21st February 1923 Flag Relay Race" at the 1923 picnic. Cockrum, N. - partnered H. Warner in the "Studebaker Gents Double" tennis at the 1923 picnic. Whether he is related to P. Cockrum (below) is not known. Cockrum, P. - listed as a competitor in the "Three-legged Race" at the 1923 picnic. Whether he is related to N. Cockrum (above) is not known. Cohen, F. - starting out in the Stores he was promoted to a Travelling Salesman in July 1922. He is listed as a competitor in the "Relay Race" at the 1922 picnic. His birthday was on the 5th November. Coker, Lindsay G. - in the December 1922 "The Echo" it makes mention of Lindsay passing his Mechanical Drawing. Working in the Body Shop he is listed as a competitor in the "Mile-End Obstacle Race", "21st February 1923 Flag Relay Race" and other events at the 1923 picnic. Cole, F.J. - Garage Foreman listed in the 1919 handbook. Whether F.J. Cole is related to Thomas Cole (below) is unknown. Cole, Thomas - employed as a driver, Thomas enlisted on 7th February 1916 to fight in the war. He was killed in action on 25th April 1918 at Villers-Bretonneux, France. Whether Thomas Cole is related to F.J. Cole (above) is unknown. Colley, W.H. - his birthday on 20th June is mentioned in the May 1923 "The Echo". Collie, F. - listed as a competitor in the "Mile-End Obstacle Race", "Hanson Street Boot Race", "21st February 1923 Flag Relay Race" and other events at the 1923 picnic. Worked in the Battery Dept. of the Motor Shop. Collings, Cliff - working in the Body Shop he curtailed his 1922 Christmas Leave to help the department. Cliff is listed as a competitor in the "Three-legged Race", "21st February 1923 Flag Relay Race" and other events at the 1921 - 1924 picnics. He won the "Guessing Competition" at the 1924 picnic. His birthday was on the 2nd March. Collins, F.J. - listed as a competitor in the "Hanson Street Boot Race" and in the "21st February 1923 Flag Relay Race" at the 1923 picnic. He worked in the Stores. Colliver, F. - listed as a competitor in the "Kicking For Goal" at the 1922 picnic. Coker, L.G. - working in the Body Shop he is listed as a competitor in the "Three-legged Race", "Bowser Boat Race" and other events at the 1922 picnic. His birthday is listed as 29th January in the January 1923 "The Echo". Conrad, O. - listed in the October 1924 "The Echo". Coombe G.C. - whether he is any relation to Herbert Coombe (below) is not known, but a G.C. Coombe listed as a competitor in the "Fordson High Jump", "Kicking For Goal" and other events at the 1921 & 1922 picnics. Coombe, Herbert Henry - joined Duncan & Fraser in 1899 in the paint department. After following the company policy for juniors, he worked in the show room cleaning and polishing the vehicles on display where he developed his interest in coach building. Waiting for an opening in the carriage department Herbert worked in the store. Once there he never looked back and willing learned the craft of coach building. He attended the Adelaide School of Mines where he learned mechanical drawing. This skill was particularly in demand with many one off carriage designs being required. Herbert developed an skill of measuring patterns and was able to make up full working drawings from which detailed costed quotations were made. Herbert was part of the Duncan & Fraser team that professionally designed and built their first car body on a De Dion Bouton ordered by Vivian Lewis Ltd. on behalf of Dr. Gault, the vehicle's owner. In 1909 Herbert was appointed as an instructor to the carriage drafting classes at the School of Mines. Herbert was continually involved in the company picnics such as a judge or in some other assisting capacity. It comes as no surprise that Herbert was the Drawing Office Foreman at Duncan & Fraser Ltd., a position he held until the closure of the business in August 1927. Herbert immediately moved to another Adelaide body builder, T.J. Richards & Sons Ltd. where he finished his working career. Coombs C. - listed in the April 1924 "The Echo". Corner, Miss V. - joined the Office Staff of Duncan & Fraser Ltd. in November 1922. Coumbe, W.H. - Nightshift Car washer and one of only 2 witnesses actually inside the factory when it caught fire in 1923. Coutts, D. - his birthday is listed as 26th February in the February 1924 "The Echo". Couzens, W.H. - listed as a competitor in the "Three-legged Race", "Bowser Boat Race" and other events at the 1922 picnic. His birthday was on the 7th September. Coward, T. - listed as a competitor in the "Three-legged Race" at the 1922 picnic. Cowan, J. - listed as a competitor in the "Light Square High Jump" and "21st February 1923 Flag Relay Race" at the 1923 picnic. Worked in the Motor Shop. Cowley, J.R. - his birthday on 1st October is mentioned in the September 1923 "The Echo". Cowling, G. - listed as a competitor in the "Three-legged Race", Kicking For Goal" and other events at the 1921 - 1923 picnics. His birthday is listed as the 2nd September. Whether he is related to H. Cowling (below) is not known. Cowling, H. - listed as a competitor in the "Mile End Obstacle Race", "Hanson Street Boot Race" and other events at the 1923 picnic. Whether he is related to G. Cowling (above) is not known. Cox, H. - listed as a competitor in the 100 yds "Associated Companies' Championship", "Ford Sheffield Handicap" and other events at the 1922 picnic. His birthday is listed as 22nd January in the January 1923 "The Echo". Coyle, Alf - joined in 1887 as a coach & hood trimmer and was noted for being one of the very best at his craft at the company. Duncan & Fraser came up with the idea of building buggies (minus painting) on their footpath as a form of advertising. The first time was on 9th September 1908 in 2 hrs 48 minutes. The second time was in September 1912 they reduced the time to 1 hr 51 minutes. Both times the limiting factor was making the hood and Alf Coyle was the man entertaining the 4,000 plus crowd with his superb skills. Unfortunately Alf "absented" himself from his work every 2 years or so and would be instantly dismissed. Alf was so good at his trade that on each return Duncan & Fraser would employ him once more. Cheney remembers that between 1903 and 1914 he was sacked and reinstated at least 5 times. Due to the decline in buggy manufacture around 1916, Duncan & Fraser declined to reinstate Alf from one of his absences. After a year or so working for himself repairing a few car bodies he joined Holden Motor Bodies as a foreman in 1917. Crabbe, Miss D. - partnered Miss A. Goldring in the "Ladies' Double Championship" tennis and was a competitor in the 50 yds "Ladies' Championship" running race at the 1922 picnic. She later partnered H. Warner in the "Thornycroft Mixed Doubles" tennis at the 1923 picnic. Craddock, S. - in 1881 Craddock was already a senior tradesman at Duncan & Fraser. Together with his apprentice Alexander Smith-Robertson they built a magnificent four-in-hand carriage for the Bowman family at Mintaro. Crook, S. - working in the Trim Shop he is listed as a competitor in the "Relay Race", "Centipede Race and other events at the 1922 picnic. Cummins, Mr. - birthday listed at 20th September in the September 1922 issue of "The Echo". Currie, L.G. - working in the Body Shop he is listed on the organising committee and competing in various events at the 1923 & 1924 picnics. His birthday was on the 6th November. Whether he is related to L.J. Currie (below) is not known. Currie, L.J. - listed as a competitor in the "Three-legged Race", "Ford Sheffield Handicap" and other events at the 1923 picnic. Whether he is related to G. Currie (above) is not known. Daniels, A. - listed as a competitor in the "Mile-End Obstacle Race", "Hanson Street Boot Race" and other events at the 1923 picnic. Darling, Miss - listed as a competitor in the 50 yds "Waymouth Street Ladies' Championship" at the 1923 picnic. Davey, Arnold - a Justice of the Piece, Davey was appointed as an Advisory Director in 1912 in the newly floated public company. Davies, A. - listed as a competitor in the "Bowser Boat Race", "Relay Race" and other events at the 1921 & 1922 picnics, he was the Sheet-Metal Department Foreman at the time of the fire in 1923. He was also on the organising committee and participated in some of the events at the 1923 picnic and was on the organising committee for the 1924 picnic. Whether he is related to K. Davies (below) is not known. Davies, K. - listed as a competitor in the "Mile End Obstacle Race", "Hanson Street Boot Race" and other events at the 1923 picnic. Whether he is related to A. Davies (above) is not known. Davis, Alf - listed as a competitor in the "Ford Sheffield Handicap" at the 1922 picnic, Alf was the Drills Section Foreman at the time of the fire in 1923. Whether he is related to Miss Davis or K. Davis (below) is not known. Davis, Miss - listed as a competitor in the 50 yds "Ladies' Championship" running race at the 1922 & 1923 picnics. She was on the organising committee for the 1923 & 1924 picnics. Whether she is related to Alf Davis (above) or K. Davis (below) is not known. Davis, K.W. - listed in the April 1924 "The Echo". Whether he is related to Alf Davis or Miss Davis (above) is not known. Dawes, Miss O.M. - her birthday on 30th October is mentioned in the September 1923 "The Echo". Whether she is related to Miss Dawes (below) is not known. Dawes, Miss V. - listed as a competitor in the 50 yds "Waymouth Street Ladies' Championship" at the 1923 picnic. Whether she is related to Miss Dawes (above) is not known. Dawson, R.H. - joined the Studebaker Sales Staff at Duncan & Fraser Ltd. in October 1924. Whether he is related to Miss Dawson (below) is not known. Dawson, Miss T. - partnered Miss N. Ashton in the "Ladies Double Championship" tennis was also a competitor in the 50 yds "Ladies' Championship" running race at the 1922 picnic. She later partnered A.M. Gould in the "Thornycroft Mixed Doubles" tennis at the 1923 picnic. Whether she is related to R. Dawson (above) is not known. Day, T. - listed in the April 1924 "The Echo". Dealtry, F.A. - his birthday on 4th March is mentioned in the February 1923 "The Echo". Dean, Miss J. - listed in the August 1924 "The Echo". Deane, J. - listed as a competitor in the "Mile-End Obstacle Race", "Hanson Street Boot Race" and other events at the 1923 picnic. De Cean, Frederich Archibald - employed in the storeroom, Fred enlisted on 26th July 1917 to fight in the war. He was killed in action on 13 September 1918 fighting in France. Degenhardt, C. - listed in the August 1924 "The Echo". Dellaway, R. - listed as a competitor in the "Three-legged Race" at the 1921 picnic. Dennis, E. - his birthday on 18th June is mentioned in the May 1923 "The Echo". Dilliway, R.J."Bob" - working as an apprentice in the Body Shop he is listed on the Executive Committee of the Social Club in 1922 and as a competitor in the "Bowser Boat Race", "Kicking For Goal" and other events at the 1921 - 1924 picnics. During the Summer of 1922/23 Bob aged only 18 years old represented South Australia in swimming in the 100 yds & 440 yds events. Dittmar, B. - working in the Motor Shop he is listed on the Executive Committee of the Social Club and as a competitor at the 1921 picnic. Dixon, Arthur - commenced working for Duncan & Fraser in 1908. Arthur is listed in the organising committee for the 1921 - 1923 picnics. Working in the Motor Shop he is also listed as a competitor in the "Relay Race", "Bowser Boot Race" at the 1921 picnic. Arthur resigned in January 1923 after 14 years with the company taking alternative employment on the advice of his doctor. In the January 1923 issue of "The Echo" it make mention of "Mr. Richard Duncan presented Mr. Dixon with a useful gift in the shape of a set of pipes, as a token of esteem of his fellow workmen in the Motor Department". Dohn, E.B. - listed as a competitor in the "Hanson Street Boot Race", "Three-legged Race" and other events at the 1923 picnic. Donahue, J. - listed as a competitor in the "Relay Race" at the 1921 picnic. Worked in the Stores. Dove, A. - working in the Stores he is listed as a competitor in the "21st February 1923 Flag Relay Race", "Fifty-Nine Three-legged Race" and other events at the 1923 picnic. His birthday is listed as 23rd January in the January 1923 "The Echo". Dowling, J. - his birthday on 23rd November is mentioned in the November 1924 "The Echo". Whether he is related to L. Dowling or W. Dowling (below) is not known. Dowling, L.F. - his birthday on the 17th September is mentioned in the September 1922 "The Echo". Whether he is related to J. Dowling (above) or W. Dowling (below) is not known. Dowling, William R. - in the August 1922 "The Echo" Will Dowling is listed as one of the longest serving employees still in the business. By this time he was also responsible for showing visitors through the factory. The visitors list for 1922 included Ussher Inventions Ltd. from Johannesburg (South Africa), George Geard & Co. Ltd. from Launceston (Tasmania) and Peel Ltd. (body builders) from Brisbane (Queensland). Will is also listed in the organising committee of the 1921 - 1924 picnics. His birthday was on the 9th September. Whether he is related to J. Dowling or L. Dowling (above) is not known. Draper, C. - his birthday on 11th June is mentioned in the May 1923 "The Echo". Drew, W. - working in the Trim Shop he is listed as a competitor in the "Relay Race", "Kicking For Goal" and other events at the 1922 picnic. Driver, Stan - working as a driver for Duncan Motors Ltd. out at the Mile End site. In June 1924 followed a government sponsored trip through Central Australia with "two high powered six cylinder cars" driving a Ford. His account of his trip made interesting reading in the July & August 1924 issues of "The Echo". Duncan, Allan Petrie - Allan (b 6th June 1901) was oldest son of Archie Duncan from his first marriage and joined Duncan & Fraser Ltd. around 1922. He partnered H.E. Schultz in the "Studebaker Gents Double" tennis and competed in the "21st February 1923 Flag Relay Race"at the 1923 picnic. In the 1923 picnic program he is listed as working in the Offices. Partnering H. Schultz at the 1924 picnic they won the Men's Doubles Tennis Tournament. Allan was last Duncan family member to work for Duncan & Fraser Ltd. and was retrenched when the business ceased trading in August 1927. Duncan, Archibald Walker "Archie" - Archie (b 1870) was the third son and 5th child of James Duncan joining Duncan & Fraser as a message boy in 1887. Office work suited him very well and he stayed in this capacity for his entire working career. He became a part owner in 1908 and later a Company Director with the public float in 1913. When the business ceased trading in August 1927, Archie continued his administrative duties for many years winding up the business. Archie died in 1942. Duncan, David - no relation to the Duncan family that owned the business, David was working in the Garage when he enlisted on 13th November 1915 to fight in the war. His position was kept open when he returned to Australia on 9th February 1919. Working in the Motor Shop, David is listed as a competitor in the "Bowser Boat Race", "21st February 1923 Flag Relay Race" and other events at the 1922 & 1923 picnics. We also know his birthday was on the 4th December. Duncan, Hugh Sinclair - Hugh (b 1894) was the oldest son of James Newell Duncan and therefore James Duncan's first grandchild. He joined Duncan & Fraser Ltd. as a draughtsman in 1914. Why Hugh did not enlist to fight in the war is not known by this author. In late 1916 Hugh travelled to America to the Firestone Tyre Company. He was part of the team of men that accurately positioned the South Australian & West Australian border for the first time using radio waves in 1919. In December 1922 Hugh passed his exams in Banking, Exchange & Economic Geography as part of his degree with the School of Mines. In January 1923 he was promoted to the postion of "Assistant Sales manager". Hugh started the "Dunfra" brand to assemble radios in 1924. He was retrenched when the business ceased trading in August 1927. Hugh died in 1959. Duncan, James - James (b 1840) emigrated to Australia from Scotland in 1859. He started his own shop at Norwood in 1863. In 1865 he joined up with another Scotsman James Fraser founding the partnership of Duncan & Fraser in Franklin Street, Adelaide. A truly energetic person with excellent business acumen and impeccable character, the business flourished. James single handed brought the first car agency to Adelaide and South Australia. James died in 1908 leaving the business to his four sons. Duncan, James Newell - James Newell (b 1863) was the oldest of the James Duncan's nine children. He joined Duncan & Fraser as an apprentice coach trimmer in 1879 mentored to James Thorogood. Although he always enjoyed working out on the shop floor, family duties prevailed being the oldest son. He became a part owner in 1908 and later Managing Director with the public float in 1913. When the business ceased trading in August 1927, he continued his managerial duties winding up the business. James Newell's retirement was relatively short lived when he died in 1932. See the Duncan Family page for more details. Duncan, Keith Sinclair - Keith (b 1900) was the second son of James Newell Duncan and Hugh's younger brother. He joined Duncan & Fraser Ltd. when he qualified from university as an engineer in 1921. It is no surprise that Keith was managing the entire Motor Shop at the time of the fire in 1923. Keith was highly energetic, superbly qualified and a natural leader representing the next generation of Duncans ready to lead and manage the family business for the future. A sad indictment to the Duncan brothers "master and man" complex they did not recognise Keith's skills, ideas, enthusiasm and drive of the person that should of been groomed as the next Managing Director. The Duncan brothers indeed chose not hand over any managerial ownership or authority in any capacity to any of their sons and decided instead to close the business in August 1927. Duncan, Richard Alexander - Richard (b 1871) was the fourth son and 6th child of James Duncan. He joined Duncan & Fraser as an office boy in 1888, but did not like it and instead found work with the black smiths. In 1890 Richard went to Melbourne as an apprentice electrical engineer returning in 1894. Richard and his wife Florence were both founding members of the Automobile & Motor Cycle Club of South Australia (now known as the Royal Automobile Association) in 1903. Richard became a part owner in 1908 and later a Company Director with the public float in 1913. When the business ceased trading in August 1927, he continued his managerial duties finally winding up all of the business interests in 1942. Richard, the youngest of the four brothers lived a long and happy retirement and died in 1954. Duncan, Robert - Robert (b 1868) was the second son and fourth child of James Duncan joining Duncan & Fraser on 14th December 1883 picking horse hair, but very soon after was trained in body building and machining. Robert became a part owner in 1908 and later a Company Director with the public float in 1913. His duties seem to of been an "Executive Nature" that seemed to always involve interstate and overseas travel. It is said that Robert recognised the full potential of a Duncan & Fraser building their own coach work on a Ford car. In 1911 the first "Deluxe" bodied Ford had been built with Robert proudly demonstrating both the car and their body around Adelaide. When the business ceased trading in August 1927, he continued his managerial duties. However, Robert's retirement was short lived when he died in 1929 less than 2 years after the business closed. Dunkley, H. - listed as a competitor in the "Mile-End Obstacle Race", "Hanson Street Boot Race" and other events at the 1923 picnic. Dunn, John - met James Duncan while working in a gang of men reassembling Duncan & Fraser trams at Ballarat in the early 1880's. A talented body builder, James Duncan enticed him to leave his native Ballarat and to join the partnership and move to Adelaide. John was deeply involved in the tram side of the business including Kilkenny and was frequently sent interstate representing the company assembling trams. In 1910 a "Works Manager" position was being created for which he applied. Howie Spafford, the Duncan brothers nephew was appointed to fill the role which Dunn saw as blatant nepotism as Howie had only just returned from many years overseas. This was unacceptable to him and he promptly resigned joining Pengelly's as one of their managers taking with him over 25 years of valuable tram building experience. Once the initial 100 electric trams were completed for the MTT in Adelaide, a contract that was placed before Dunn's resignation, Duncan & Fraser failed to secure any other Adelaide tram building contracts losing them all to Pengelly's. Whether this has anything to do with John Dunn's appointment to Duncan & Fraser's competition is open to speculation and perhaps just coincidence. It could be said that letting John Dunn leave the business may have been the first significant management misjudgment by the Duncan brothers. In hindsight, Howie Spafford's appointment to this roll proved beyond any doubt to be the correct choice for the business regardless of the family connection. Dutton, Miss E. - working in the Ledgers Dept. she is listed in the organising committee and was a competitor in the 50 yds "Ladies' Championship" running race at the 1921, 1922 & 1923 picnics. She was on the organising committee for the 1923 picnic. She was one of the winners in the "Ladies' Flag Relay Race" at the 1924 picnic. Whether she is related to any other Dutton's above or below, or the famous South Australian Dutton family from Kapunda is not known. Dutton, Miss E. - this E. Dutton joined the Office Staff of Duncan & Fraser Ltd. in November 1922 and was the sister of Miss I. Dutton (below). Whether she is related to any other Dutton's above or below, or the famous South Australian Dutton family from Kapunda is not known. Dutton, Miss I. - was the sister of Miss E. Dutton immediately above and was already employed at Duncan & Fraser Ltd. when her sister was appointed in November 1922. We also know her birthday was on the 18th December as it is mentioned in the December 1923 issue of "The Echo". Whether she is related to any other Dutton's above or below, or the famous South Australian Dutton family from Kapunda is not known. Dutton, M.C. - his birthday on 11th October is mentioned in the September 1923 "The Echo". He is also listed in the October 1924 "The Echo". Whether she is related to any other Dutton's above or below, or the famous South Australian Dutton family from Kapunda is not known. Dutton, Miss R. - listed in the organising committee for the 1924 picnic and was one of the winners in the "Ladies' Flag Relay Race" at the 1924 picnic. We also know her birthday was on the 18th December as it is mentioned in the December 1924 issue of "The Echo". Whether she is related to any other Dutton's above or below, or the famous South Australian Dutton family from Kapunda is not known. Easom, C. - listed on the organising committee for the 1921 - 1924 picnics, his position was the Foreman of the Vyce & Drills department at the time of the fire in 1923. His birthday was on the 20th January. B>Edgar, C. - his birthday is listed as the 19th October in the September 1922"The Echo". Edwards, D. - working in the Garage he is listed as a competitor in the "Relay Race" at the 1922 picnic. Whether he is related to D. Edwards or "George" Edwards (below) is not known. Edwards, F.R. - his birthday is listed in the December 1922 issue of "The Echo". Whether he is related to D. Edwards (above) or "George" Edwards (below) is not known. Edwards, Peter "George" - employed as a pattern maker when he enlisted on 28th January 1916 to fight in the war. He was killed in action on 7th October 1917 at Zonnebeke near Ypres, Belgium. Whether he is related to D. Edwards or "F. Edwards (above) is not known. Elliot, C.F. - listed as a competitor in the "Light Square High Jump", "Ford Sheffield Handicap" and other events at the 1923 picnic. His birthday on 31st December is mentioned in the December 1924 "The Echo". Whether he is related to K. Elliot or R. Elliot (below) is not known. Elliot, Keith H. - listed in the April 1924 "The Echo" as working at Mile End and contributed a lengthy article about the rapid changes in car design and the unpacking of the new Studebaker "Sedan". Keith was also on the Executive Committee for the 1924 picnic. Whether he is related to C. Elliot (above) or R. Elliot (below) is not known. Elliot, F.R. - listed as a competitor in the "Three-legged Race" at the 1922 picnic. His birthday was on the 23rd October. Whether he is related to C. Elliot or Keith Elliot (above) is not known. Ellis, Alexander Joseph - employed as a horse driver when he enlisted on 24th August 1914 to fight in the war. He died of his wounds sustained in the Somme offensive on 4th November 1916 at the No.38 Casualty Clearing Station, Somme, France. He was not related to Walter Ellis (below). Ellis, Walter Norman - was employed as a machinist when he enlisted on 17th May 1915 to fight in the war. His position was kept open when he returned to Australia on 15th January 1919. He was not related to Alexander Ellis (above). Emsley, Francis - was employed as a fitter when he enlisted on 7th December 1915 to fight in the war. His position was kept open when he returned to Australia on 31st March 1919. Evans, Miss V.V. - working with the Ford Sales Staff in Duncan Motors Ltd. she is listed in the organising committee and as a competitor in the 50 yds "Ladies' Championship" running race at the 1922 & 1923 picnics. She was also on the organising committee for the 1923 & 1924 picnics. Eyres, H. - his birthday is listed as 21st January in the January 1923 "The Echo". Fagan, William A. - begun his career with Duncan & Fraser Ltd. in April 1917 Bill is listed as the Head Correspondence Clerk in the 1919 handbook, he is also listed as Secretary on the Executive Committee of the Social Club and in various events at the 1921 & 1922 picnics. In 1922 he was made the Editor of the revived company magazine "The Echo" where we can find his birthday listed as 22nd October. In September 1923 he "resigned" his Advertising Staff postion from Duncan & Fraser Ltd. for alleged"financial impropriety". Farmer, H. - his birthday is listed as 2nd September in the September 1922 "The Echo". He is later listed in the August 1924 "The Echo". Farrell, Hubert Leonard - one of three Farrell brothers all employed at Duncan & Fraser. Hubert was the middle brother and working as a driver when he enlisted 10th August 1915 to fight in the war. All three brothers returned from the war and all of their positions were kept open for their return. Farrell, Lindsay John - Hubert and Stanley's younger brother, Lindsay was also employed as a driver when he enlisted to fighting the war. All three brothers returned from the war and all of their positions were kept open for their return. Farrell, Stanley Longhurst - the older brother of Hubert and Lindsay and was working as a motor mechanic when he enlisted on 27th August 1914 to fight in the war. Stan is the oldest of the three Farrell brothers and all of them returned from the war with their respective positions kept open for their return. Fax, W.L. - his birthday on 28th December is mentioned in the December 1924 "The Echo". Fearby, A. - worked for Duncan & Fraser Ltd. selling Thornycroft Lorries. He resigned in September 1924. Fenn, A.A. - Resident Caretaker and was one of only 2 people inside the factory at the time of the actual fire on 21st February 1923. His birthday on the 13th January is mentioned in the December 1922 issue of "The Echo". Whether he is related to Miss Fenn (below) is not known. Fenn, Miss E. - won the "Ladies' Championship" at the 1924 picnic. Whether she is related to A. Fenn (above) is not known. Fenton, B. - listed as a competitor in the "Three-legged Race", "Kicking For Goal" and other events at the 1921 picnic. Fenwick, H.W. - listed on the organising committee for the 1923 & 1924 picnics. Fidge, G. - working in the Mill area he is listed as a competitor in the "Three-legged Race", Bowser Boat Race" and other events at the 1922 picnic. He also partnered D. Robertson in the "Studebaker Gents Double" tennis at the 1923 picnic. Finch, G. - his birthday on 26th December is mentioned in the December 1923 & December 1924 "The Echo". Finkelde, O. - working in the Sheet Metal Dept. he is listed as a competitor in the "Mile-End Obstacle Race", "21st February 1923 Flag Relay Race" and other events at the 1923 picnic. Fitts, Mrs. - listed as a competitor in the 50 yds "Waymouth Street Ladies' Championship" at the 1923 picnic. Fletcher, Anthony "Tony". - listed as a competitor in the "Fordson High Jump", "Bowser Boat Race" and other events at the 1921 & 1922 picnics. Whether he is related to F. Fletcher (below) is not known. Fletcher, F. - listed as a competitor in the "Ford Sheffield Handicap" 135 yds running race at the 1921 picnic. Whether he is related to A. Fletcher (above) is not known. Forsyth, F.J. - his birthday on 11th March is mentioned in the February 1923 "The Echo". Francis, R.A. - his birthday on 3rd December is mentioned in the January 1923 "The Echo". Fraser, James - co-founder with James Duncan in 1865. Died suddenly of Lymphoma in 1886. James Duncan bought out his share of the partnership from his widow for an undisclosed amount, however, part of the deal was the Fraser name remained with the business. Frear, F. - his birthday on 7th March is mentioned in the February 1923 "The Echo". Frost, K.C. - working in the offices he is listed as a competitor in the "Three-legged Race", "Bowser Boat Race", "Hanson Street Boot Race" and other events at the 1922 & 1923 picnics. His birthday was on the 4th November. Fuller, J.M. - his birthday on 23rd November is mentioned in the November 1924 "The Echo". Whether he is related to R. Fuller (below) is not known. Fuller, R. - listed in the October 1924 "The Echo". His birthday was on the 17th October. Whether he is related to J. Fuller (above) is not known. Fulton, S.A. - his birthday was listed in the September 1922 "The Echo" as the 24th October. Later there is another listing in the October 1924 "The Echo". Fyffe, A. - his birthday is listed as 24th February in the February 1924 "The Echo". Gable, H. - listed as a competitor in the "Fordson High Jump", "Three-legged Race" and other events at the 1921 picnic. Galbraith, James - working as a junior in the General Office passed his final accountancy examinations in August 1922. His achievement is mentioned in the September 1922 issue of "The Echo". James was promoted to accountant in November 1922 filling the postion vacated by Mr. Ross. James is also listed in the Executive Committee for the Social Club in 1921 - 1923. James also partnered Mary Duncan in the "Ladies' & Gents Doubles Championship" tennis and R. McBride in the "Men's Double Championship" tennis at the 1922 picnic. The next year James partnered Miss Ritchie in the "Thornycroft Mixed Doubles" tennis A.M. Gould in the"Studebaker Gents Double" tennis at the 1923 picnic. Gardner, A. - working in the Garage he is listed as a competitor in the "Centipede Race" at the 1921 & 1922 picnics. We also know his birthday was on the 3rd December. Gathercole, W. - listed as a competitor in the "Mile End Obstacle Race", "21st February 1923 Flag Relay Race" and other events at the 1923 picnic. Worked in the Motor Shop. His birthday on 27th December is mentioned in the December 1923 "The Echo". Gatley, C. - listed as a competitor in the "Light Square High Jump" at the 1921 picnic. Also competed in the "Hanson Street Boot Race" at the 1923 picnic. Whether he is related to W.L. Gatley (below) is not known. Gatley, W.L. - working in the offices he is listed on the Executive Committee of the Social Club in 1921 & 1922 and on the organising committee for the 1923 & 1924 picnics. He is also listed as a competitor in many events at the 1923 & 1924 picnics. His birthday was on the 19th February. Whether he is related to C. Gatley (above) is not known. Gent, R. - his birthday is listed as 17th February in the February 1924 "The Echo". George, C. - his birthday on 21st October is mentioned in the September 1923 "The Echo". Gilbert, E.E. - his birthday on 17th February is mentioned in the February 1923 "The Echo". Whether he is related to J. or W. Gilbert (below) is not known. Gilbert, J. - listed as a competitor in the "Mile End Obstacle Race", "Hanson Street Boot Race", "21st February 1923 Flag Relay Race" and other events at the 1923 picnic. He worked in the Offices. Whether he is related to E. Gilbert (above) or W. Gilbert (below) is not known. Gilbert, W. - his birthday on 15th December is mentioned in the December 1924 "The Echo". Whether he is related to E. or J. Gilbert (above) is not known. Gillet, W.H. - his birthday on 15th December is mentioned in the December 1923 "The Echo". Goldring, Miss A. - joined the company in 1918 as a Switchboard Operator. By the time of the fire she was one the receptionists. She is also listed as a competitor in the 50 yds "Ladies' Championship" running race at the 1921 - 1923 picnics. Her birthday was the 28th September. After 6 years with the business she resigned in April 1924 to get married. Goldsack, Mrs. M.A. - partnered partnered Mary Duncan playing tennis in the "Ladies Double Championship" and was a competitor in the 50 yds "Ladies' Championship" running race at the 1922 picnic. She later partnered P. Callier in the "Thornycroft Mixed Doubles" tennis at the 1923 picnic. She was also Part of the organising committee for the 1923 & 1924 picnics. Partnering Miss Ritchie at the 1924 picnic they won the Ladies Doubles Tennis Tournament. Her birthday was on the 14th February. Good, G.H. - joined the Ford Sales Staff at Duncan motors Ltd. in September 1924. Gould, A.M. - partnered Miss Dawson in the "Thornycroft Mixed Doubles", J. Galbraith in the "Studebaker Gents Double" tennis and on the organising committee for the 1923 & 1924 picnics. His birthday on 27th December is mentioned in the December 1923 & December 1924 "The Echo". Gould, Eric W.B. - an apprentice motor mechanic he his is mentioned in the December 1924 "The Echo" with "...producing good results, passing 1st Class with a prize for student showing greatest improvement in Grade 1 Motor Mechanics". Grant, A. - working in the Sheet Metal Shop he is listed as a competitor in the "Three-legged Race", "Bowser Boat Race" and other events at the 1921, 1922 & 1923 picnics. In the 1923 picnic program he is listed as being an oxy-welder. Whether he is related to G. Grant (below) is not known. Grant, G. - he is listed in the April 1924 "The Echo". Whether he is related to A. Grant (above) is not known. Gray, T.M. - listed as a competitor in the "Light Square High Jump", "Hanson Street Boot Race" and other events at the 1923 picnic. Worked in the Garage. Green, H. - listed in the August 1924 "The Echo". Whether he is related to J. Green (below) is not known. Green, J.V. - listed as a competitor in the "Three-legged Race", "Bowser Boat Race" and other events at the 1921 & 1922 picnics. His birthday was on the 13th September. He resigned on 18th January 1923 to take up another postion "...in the city". Whether he is related to H. Green (above) is not known. Greeneklee, H.J. - his birthday is listed as 23rd January in the January 1923 "The Echo". Griffen, Andrew John - working as a labourer when he enlisted on 14th April 1916 to fight in the war. His position was kept open when he returned to Australia on 1st February 1919. Grosvenor, George H. - working in the Trim Shop he is listed as a competitor in the "Relay Race", "Kicking For Goal", "centipede Race" and other events at the 1921, 1922 & 1923 picnics. Gubbins, S.F. - listed in the August 1924 "The Echo". Gunn, Horrie - was already working at Duncan & Fraser when the Oldsmobile arrived in late 1903. Cheney remembers him as a mechanic and a driving demonstrator. By 1921 he had moved into the Stores. Horrie was listed as a competitor in the "Three-legged Race" and other events at the 1921 - 1923 picnics. In January 1923 he resigned from Duncan & Fraser Ltd. and bought Evan's Power Plus Motorcycles. Haines, S.G. - his birthday on 18th September is mentioned in the September 1922 "The Echo". Hall, C.G. - working in the Stores he is listed as a competitor in the "Kicking For Goal", "Associated Companies' Championship" and other events at the 1922 & 1923 picnics. His birthday is listed as 28th February in the February 1924 "The Echo". Hall, C.T. - his birthday is listed as 23rd January in the January 1923 "The Echo". Hall, David - worked in the Stores Department at the time of the fire in February 1923. One of the "Three Halls", David worked with Sterling and Charles Hall. All 3 were not related to each other. Hall, Sterling - worked in the Stores Department at the time of the fire in February 1923. Sterling is also listed in the organising committee for the 1921 - 1924 picnics and as a competitor in the "Bowser Boat Race" for the 1921 & 1922 picnics. We also know his birthday was on the 18th November. Hamilton, J. - his birthday is listed as 19th February in the February 1924 "The Echo". Hamilton, Miss Mary - working in the Costing Dept. she partnered H.J. Byrne in the "Thornycroft Mixed Doubles" tennis and competed in the 50 yds "Waymouth Street Ladies' Championship" at the 1923 picnic. Hammer, C. - listed as a competitor in the "Ford Sheffield Handicap" at the 1923 picnic. Whether he is related to E. Hammer (below) is not known. Hammer, E. - working in the Sheet Metal Dept. he is listed as a competitor in the "Three-legged Race", "Bowser Boat Race" and other events at the 1922 & 1923 picnics. His birthday is listed as 3rd September. Whether he is related to C. Hammer (above) is not known. Hammond, R.C. - his birthday on 7th January is mentioned in the December 1924 "The Echo". Harris, A.E. - listed in the August 1924 "The Echo". Whether he is related to Miss Harris, H. Harris, Mrs. Harris or "Sailor" Harris (below) is not known. Harris, Miss E. - partnered Miss M. Campbell in the "Ladies Double Championship" at the 1922 picnic and partnered R. McBride in the "Thornycroft Mixed Doubles" tennis at the 1923 picnic. We also know her birthday was on 12th December as it was mentioned in the December 1923 & December 1924 issues of "The Echo". Whether she is related to A. Harris (above) or H. Harris, Mrs. Harris & "Sailor" Harris (below) is not known. Harris, H.J. - listed in the August 1924 "The Echo". Whether he is related to A. Harris & Miss Harris (above) or Mrs. Harris & "Sailor" Harris (below) is not known. Harris, Mrs. R. - listed as a competitor in the 50 yds "Waymouth Street Ladies' Championship" at the 1923 picnic. Whether she is related to A. Harris, Miss Harris & H. Harris (above) or "Sailor" Harris (below) is not known. Harris, "Sailor" - working in the incoming stores at the time of the fire in 1923, his nickname came from some years served in the navy. Whether he is related to A. Harris, Miss Harris, H. Harris or Mrs. harris (above) is not known. Harrison, Henry Herbert - was working as a clerk when he enlisted on 2nd August 1915 to fight in the war. His position was kept open when he returned to Australia on 5th April 1919. Whether he was any relation to R. Harrison (below) is not known. Harrison, R.E. - his birthday on 30th June is mentioned in the May 1923 "The Echo". Whether he is related to H. Harrison (above) is not known. Hartley, H.H. - birthday listed at 24th September in the September 1922 issue of "The Echo". Whether he is related to J. Hartley (below) is not known. Hartley, Jim - listed in the organising committee of the 1921 -1924 picnics, Jim was also working as the Blacksmithing Foreman at the time of the fire in 1923. His birthday on 8th January is mentioned in the December 1924 "The Echo". Whether he is related to H. Hartley (above) is not known. Hartwell, J. - working in the Motor Shop he is listed as a competitor in the "21st February 1923 Flag Relay Race", "Fifty-Nine Three-legged Race" and other events at the 1923 picnic. Harvey, Bill - known as being very good with horses, Bill was already working at Duncan & Fraser in 1898 when they introduced their first ambulance service with Bill being offered both the driving and care taking roles. Certainly by 1903 when Cheney makes another mention of Bill and that he had been running the ambulance service for many years. When Duncan & Fraser Ltd. motorised their ambulance service in 1916 it is thought that Bill retired rather than drive a car. Hassell, Miss E. - listed as a competitor in the 50 yds "Waymouth Street Ladies' Championship" at the 1923 picnic. Hawke, A. - listed as a competitor in the "Three-legged Race", "Bowser Boat Race" and other events at the 1921 & 1922 picnics. Worked in the offices. Hayes, G. - listed as a competitor in the "Fifty-Nine Three-legged Race" at the 1923 picnic. Whether he is related to J. Hayes (below) is not known. Hayes, J. - listed as a competitor in the "Hanson Street Boot Race" at the 1923 picnic. Whether he is related to G. Hayes (above) is not known. Hayles, G.M.N. - worked for Duncan & Fraser Ltd. selling Studebaker cars. He is listed in the December 1922 issue of "The Echo". Haynes, L.R. - working in the offices he is listed as a competitor in the "Three-legged Race", "Bowser Boat Race", "Mile-End Obstacle Race" and other events at the 1922 & 1923 picnics. His birthday was on the 8th March. Heading, F.A. - his birthday on 8th March is mentioned in the February 1923 "The Echo". Hearn, J.B. - his birthday on 7th December is mentioned in the November 1924 "The Echo". Hearne, G.T. - working as a Travelling Salesman and resigned from Duncan & Fraser Ltd. in July 1922. Heath, H.H. - his birthday on 25th November is mentioned in the November 1924 "The Echo". Heaton, A. - his birthday on 13th November is mentioned in the November 1924 "The Echo". Henderson, Ralph C. - working as an apprentice Wood Machinist in the Mill area he is listed as a competitor in the "Fordson High Jump", "Three-legged Race" and other events at the 1922 picnic. In the December 1923 issue of "The Echo" Ralph's apprentice report mentions "...passing in second class and prize for drawing and arithmetic. He has improved since last year. Keep at it, Ralph." Henley, Albert Henry - working as a blacksmith when he enlisted on 9th June 1915 to fight in the war. His position was kept open when he returned to Australia on 12th April 1919. Hercus, Fred - started his life as an apprentice machinist. Fred took 3 photographs inside the new factory in 1906 which he later donated to the Duncan family. Whether he was a tradesman by then is not known as yet. Fred was remembered as a highly motivated and an exceptional tradesman. Indeed, Fred left Duncan & Fraser in the early 1920's and formed his own machining company F.W. Hercus & Co. at Thebarton. During the Second World War, F.W. Hercus & Sons Ltd. made a high quality and inexpensive small metal working lathe that populated literally hundreds of garages and workshops. Sadly, in the late 1990's F.W. Hercus & Sons Ltd. found themselves in a poor financial position and were bought out by Durden Australia allowing another Adelaide icon to quietly pass into history. Heuzenroeder, Miss G. - joined Duncan & Fraser Ltd. in early 1923 supporting the Studebaker Sales Staff. She was also listed as a competitor in the 50 yds "Waymouth Street Ladies' Championship" at the 1923 picnic. After 18 months with the business she resigned in September 1924 to enter a course of training at the Mareeba Babies' Hospital at Woodville. On her leaving she was presented with a "wristlet watch". Hewett, A.G. - listed as the First Aid person for the 1924 picnic. Heyen, H.F - joined Duncan Motors Ltd. selling Fordson Tractors in April 1923. Hickey, P. - working in the Garage he is listed as a competitor in the "Light Square High Jump", "Hanson Street Boot Race", "21st February 1923 Flag Relay Race" and other events at the 1923 picnic. Hickman, C. - listed as a competitor in the "Three-legged Race", "Bowser Boat Race" and other events at the 1922 picnic. Hicks, F. - his birthday is listed as 18th February in the February 1924 "The Echo". Higginbotham, Lloyd - Lloyd was already at the company with the arrival of the Oldsmobile in 1903. Cheney mentions that he leaned towards the mechanical side of the agency. When Cheney married his wife at Mount Barker on 4th May 1907, Lloyd chauffeured Richard Duncan and his family in an Argyll to the wedding. Higginbottom, Miss M. - her birthday on 29th December is mentioned in the December 1924 "The Echo". Hill, A. - joined Duncan Motors Ltd. as a Ford Salesman in March 1924. Whether he is related to Clem Hill (below) is not known. Hill, Clement Edward - was working as a motor mechanic when he enlisted on 24th May 1915 to fight in the war. His position was kept open when he returned to Australia on 23rd September 1916. Whether his wounds stopped him from taking up his position or is related to A. Hill (above) are not known. Hobbs, A. - working in the Garage he is listed as a competitor in the "Relay Race", "Centipede Race" and other events at the 1922 picnic. Hocking, E.E. - working as an apprentice in the Body Shop it is not known whether he is related to J. Hocking (below), but they are both listed as competitors in the "Three-legged Race", "Bowser Boat Race" and other events at the 1921, 1922 & 1923 picnics. In the December 1924 "The Echo" he is mentioned "...showing marked improvements in his studies, passing 1st Class with a prize for the most improved in Group 1". Hocking, J. - whether his is related to apprentice E. Hocking (above) is not known, but they are both listed as competitors in the "Three-legged Race" and J. Hocking also in the "Bowser Boat Race", "Ford Sheffield Handicap" and other events at the 1922 & 1923 picnics. Hogarth, J. - his birthday on 10th February is mentioned in the January 1923 "The Echo". Holmes, F.W. - listed in the August 1924 "The Echo" as working in the Motor Shop. Hone, Ron - already working in the Garage for some time he was promoted to a Studebaker Salesman for Duncan & Fraser Ltd. in September 1922. He resigned his position in December 1922. Hope, Miss I. - won the "Egg & Spoon Race" at the 1924 picnic. Hopkins, E.F. - his birthday on 13th June is mentioned in the May 1923 "The Echo". Whether he is related to F. Hopkins (below) is not known. Hopkins, Fred - he was the Trim Shop foreman at the time of the fire in 1923. His birthday on the 30th December is mentioned in the December 1922 issue of "The Echo". Whether he is related to E. Hopkins (above) is not known. Howard, Osmond John - was working in the garage when he enlisted on 20th August 1914 to fight in the war. His position was kept open when he returned to Australia on 19th July 1919. Inglis, E. Scott - married to Hugh Duncan's sister-in-law, Scott joined the company as a salesman in 1919. Scott was apparently very good at his job and had risen to the position of Sales Manager when the company closed in August 1927. Always popular with his peers and an avid tennis player, he was on the Social Club Committee for a number of years and part of the organising committees for the 1921, 1922 & 1923 picnics. French saw Scott as a very able person and invited him to join the Ford Motor Co. as their National Service Manager in 1927, a position he held to his retirement in 1964. Both of Scott's sons joined the Ford Motor Co. Brian rose to the position of Managing Director of Ford Australia, the first Australian to do so. Jackson, C.H. - Stores Manager listed in the 1919 handbook. He resigned from Duncan & Fraser Ltd. in September 1919 to take up a position with Autocar Ltd. as their Import Accessories Manager. James, D. - working as an oxy-welder in the Sheet Metal Dept. He is listed as a competitor in the "Mile End Obstacle Race", "Hanson Street Boot Race" and other events at the 1923 picnic. Whether he is related to Jimmy James (below) is not known. James, Jimmy - had been at Duncan & Fraser for a few years as a body builder when he was retrenched in 1927. He finished his working career at T.J. Richards. He was still working there when James Playford Duncan (James Duncan's oldest grandson) joined Richards after graduating from Adelaide University in 1941. Whether he is related to D. James (above) is not known. Jamieson, Reg - working in the Motor Shop Reg is listed as a competitor in the "Hanson Street Boot Race", "21st February 1923 Flag Relay Race" and other events at the 1923 picnic. Reg left around a year later in 1924 accepting a position to maintain steam cranes at the wharves in Port Adelaide. Reg was always interested in veteran cars, was an active member in the Veteran Section of the Sporting Car Club and restored one of the largest private collection of veteran cars in South Australia. One particular car he rescued was a 1912 "Deluxe" bodied Ford that was parked under a tree in a house at Hindmarsh in 1951. This car he named "Truly Fair" and was the oldest, original surviving Duncan & Fraser bodied Ford for quite some time. Apart from the Ford he also had a 1907 Argyll originally imported and sold by Duncan & Fraser in the shed and a Duncan & Fraser made horse drawn tram by the back door of his house! I was lucky enough to meet Reg when my father took me to see his wonderful collection of cars around 1982. To the best of my knowledge Reg Jamieson is the only Duncan & Fraser employee I have ever personally met. At the time I was 15 years old and regrettably I did not appreciate Reg's tangible link to Duncan & Fraser Ltd. & Duncan Motors Ltd.
Jeffrey, A.W. - working in the Trimming Department he is listed as a competitor in the "Kicking For Goal" at both the 1921 & 1922 picnics. His birthday is listed as 25th January in the January 1923 "The Echo". On 14th April 1923 he was married. During their first week od marriage Mr. & Mrs. Jeffrey went down to Outer Harbour to witness the departure of an overseas ship. A cargo net swung around and accidentally knocked Mrs. Jeffrey into the water! Mr. Jeffrey and his brother jumped in to rescue her. A local resident provided her with some dry clothes, all none the worse for wear because of the experience. Jeffries, J. - working in the Trim Shop he is listed as a competitor in the "Relay Race" at the 1922 picnic. Jenkins, R. - listed in the October 1924 "The Echo". Won the "Obstacle Race" at the 1924 picnic. Jolley, E. - whether he is related to G. Jolley (below) is not known. Jolley, G. - working in the Mill area he is listed as a first aider and participating in some events at the picnics of 1922 & 1923. His birthday was on the 5th November. Whether he is related to E. Jolley (above) is not known. Johns, C. - listed as a competitor in the "Hanson Street Boot Race" and partnered N. Munn in the "Studebaker Gents Double" tennis at the 1923 picnic. Worked in the Stores. Whether he is related to R. Johns (below) is not known. Johns, R. - working in the Garage he is listed as a competitor in the "Three-legged Race", "Relay Race" and other events at the 1922 & 1923 picnics. His birthday was on the 10th November. Whether he is related to C. Johns (above) is not known. Johnson, A. - listed as a competitor in the "Kicking For Goal" at the 1922 picnic. Johnson, Robert - in April 1924 issue of "The Echo" he is listed as the Company Buyer. Jones, A.J. - working as a Travelling Salesman he is listed on the organising committee for the 1921 picnic. He resigned from Duncan & Fraser Ltd. in July 1922. Whether he is related to R. Jones (below) is not known. Jones, R.K. - his birthday on 14th February is mentioned in the January 1923 "The Echo". Whether he is related to A. Jones (above) is not known. Jose, Harold Newlyn - a brass moulder by occupation, Harold enlisted on 20th July 1915 to fight in the war. He was killed in action on 20th July 1916 at Fluerbix, France. Jose, W.L. - listed as joining up to fight in the war. His position was kept open for his return. Joyce, J. - listed as a competitor in the "Kicking For Goal" at the 1922 picnic. Whether he is related to R. Joyce (below) is not known. Joyce, R. - listed in the August 1924 "The Echo". Whether he is related to J. Joyce (above) is not known. Keen, L. - listed as a competitor in the "Kicking For Goal" at the 1921 picnic. Keighran, H. - his birthday on 15th December is mentioned in the December 1924 "The Echo". Kelly, G. - listed as a competitor in the "Mile-End Obstacle Race", "three-legged Race" and other events at the 1923 picnic. His birthday on 1st March is mentioned in the February 1924 "The Echo". Kelly, Joseph Arnold "Joe" - joined in 1914 as a Ford salesman. In early 1916 Jack Gaffney, owner of the Birdsville Hotel bought a new Ford and asked Joe to drive it back for him. The company agreed and on 12th March 1916 Joe Kelly left Glenelg with the Gaffney family totalling 5 adults and 3 children for Birdsville. The 750 mile trip took 14 days with the Ford travelling the nearly whole way under her own steam apart from one point where she had to pulled out by horses. The Koonchera Sandhills near the Diamantina River proved tougher than the Ford where a horse team from a nearby station was loaned to them to pull the Ford through the tough terrain. Joseph Kelly and the Ford owned by Jack Gaffney was the first car to drive up the Birdsville Track. For the record, it took Joe Kelly 7 days to use a packhorse and as a guest of "His Majesty's Mail" on the mail cart to get back to Adelaide where he resumed his post with quite a story to tell. Joe enlisted on 21st December 1916 to fight in the war. Upon his return he did not take up a post with Duncan & Fraser Ltd.
Kelton, Lance - started as an apprentice in 1922. He is listed as a competitor in the "Three-legged Race", "Bowser Boat Race" and other events at the 1922 picnic. In the December 1923 issue of "The Echo" it makes mention "...is showing ability and passed second class. Lance is progressing favorably, and we wish him success for the future. Kemsley, Robert - was working as a machinist when he enlisted 13th September 1915 to fight in the war. He was killed in action on 2nd April 1917 near Noreuil, France. Kilberg, Miss - listed as a competitor in the 50 yds "Waymouth Street Ladies' Championship" at the 1923 picnic. Kilmartin, Miss - listed as a competitor in the 50 yds "Ladies' Championship" running race at the 1921 & 1922 picnics. Her birthday was on the 1st February. King, A.T. - listed as a first aider and as a competitor in the "Bowser Boat Race", "Kicking For Goal" and other events at both the 1921 & 1922 picnics. Kingdon, J. - started with Duncan & Fraser Ltd. around March 1914. He is listed as a competitor in the "Kicking For Goal" at the 1921 picnic. His birthday is listed as 31st January in the January 1923 "The Echo". In September 1923 he left Duncan & Fraser Ltd. after 9� years service to take up an authorised Ford dealership at Loxton. Kinkelde, O. - listed as a competitor in the "Hanson Street Boot Race" at the 1923 picnic. Kinnear, F.D. - his birthday on 28th December is mentioned in the December 1923 "The Echo". Kirk, Thomas Henry - was employed as a driver when he enlisted on 9th August 1915 to fight in the war. His position was kept open when he returned wounded to Australia on 4th May 1917. Whether Thomas was fit enough to take up his position is not known. Klopper, A. - listed as a competitor in the "Kicking For Goal", "Centipede Race" and other events at the 1922 picnic. Knight, R. - working on the Offices he is listed as a competitor in the "Mile-End Obstacle Race", "Light Square High Jump", "21st February 1923 Flag Relay Race" and other events at the 1923 & 1924 picnics. he won the "Boot Race" at the 1924 picnic. Kruger, H. - listed as a competitor in the "Mile End Obstacle Race" and the "Fifty-Nine Three-legged Race" at the 1923 picnic. Laker, Miss E. - listed as a competitor in the 50 yds "Ladies' Championship" running race at the 1921 & 1922 picnics.her birthday was on the 14th September. Lambert, A.E. - listed in the October 1924 "The Echo". Whether he is related to H. Lambert & J. Lambert (below) is not known. Lambert, H. - listed in the April 1924 "The Echo". Whether he is related to A. Lambert (above) or J. Lambert (below) is not known. Lambert, J.F. - won the "Travellers' Race" at the 1924 picnic. Whether he is related to A. Lambert & H. Lambert (above) is not known. Lamkin, W.L. - listed in the October 1924 "The Echo". Lance, J.H. - listed as a competitor in the "Hanson Street Boot Race", "Three-legged Race" and other events at the 1923 picnic. Landridge, F. - listed as a competitor in the "Kicking For Goal" at the 1922 picnic. His birthday was on the 7th March. Langford, A. - listed in the August 1924 "The Echo". Last, W. - listed as a competitor in the "Three-legged Race" at the 1921 picnic. His birthday on 24th December is mentioned in the December 1924 "The Echo". Lawrence, J. - listed as a competitor in the "Light Square High Jump","Associated Companies' Championship" and other events at the 1923 picnic. Leane, W.P.G. - listed in the August 1924 "The Echo". Leeder, Miss C. - listed as a competitor in the 50 yds "Ladies' Championship" running race at the 1921, 1922 & 1923 picnics. her birthday was on the 20th June. Lemmey, S.A.S. - joined Duncan Motors Ltd. as a Ford Salesman in March 1924. Lennard, I.A.D. - his birthday on the 28th February is mentioned in the February 1923 "The Echo". Lockwood, F. - listed as joining up to fight in the war. His position was kept open for his return. Long, L.W. - his birthday on 25th December is mentioned in the December 1924 "The Echo". Lucas, H.A. - listed as joining up to fight in the war. His position was kept open for his return. Ludlow, J. - his birthday on 11th November is mentioned in the December 1922 issue of "The Echo". MacThomas, H. - won the "High Jump" at the 1924 picnic. Madill, H. - working in the Trim Shop he is listed as a competitor in the "21st February 1923 Flag Relay Race" at the 1923 picnic. Maloney, S.R. - his birthday on the 9th January is mentioned in the December 1922 issue of "The Echo". Mander, W.M. - an apprentice for the business he is listed as a competitor in the "Three-legged Race" at the 1923 picnic. In the December 1924 "The Echo" he is mentioned "...making good headway, passing 1st Class with a prize for the best all-round apprentice". Mann, Fred Sinclair - joined in 1903 as a messenger boy and later recalled the first Oldsmobile arriving and being unpacked "...using the owner's manual the vehicle was started, the gear lever was pulled and the car went backwards through and office wall!" Fred studied to be an accountant rising to the position of Company Secretary in 1912. Fred was methodical, very well liked and respected by his peers but resigned his senior staff position at Duncan & Fraser Ltd. in 1920 to join Cheney in a business venture. Together they set up Mann Motors to sell Chevrolet cars. By 1924 Mann Motors under Fred's fine management was challenging Duncan & Fraser Ltd. for No.1 spot and later even bought out Vivian Lewis. Marrett, H. - his birthday on 23rd December is mentioned in the December 1923 "The Echo". Martin, H.J. - listed in the August 1924 "The Echo". Whether he is related to R. Martin (below) is not known. Martin, A. Ross - is listed in the miscellaneous gang, whatever that may be, at the time of the fire in 1923. His birthday was on the 2nd March. Whether he is related to H. Martin (above) is not known. Marvel, B. - partnered A. Carmody at the 1924 picnic and won the "Three-legged Race". Marvell, H.J. - an apprentice for the company he is listed as a competitor in the "Three-legged Race" at the 1921 & 1922 picnics. In the December 1924 "The Echo" he is mentioned as "...passing his 1st Class with the best percentage of points, and won a prize for the best all round performance". His birthday was on the 6th February. Mason, George - joined in 1903 working on Oldsmobiles. George actively lobbied the Duncans for extra space for the service department. His efforts were rewarded in February 1916 the vacant stable space behind Duncan & Fraser was leased. On 28th July 1916 it was recorded that 1,688 cars had passed through the garage in a single week. By 1919 he had risen to the position of Foreman of the Service Department. He regularly contributed articles to the SA Motor titled "The Ford Owner's Section" allowing owners to maintain their own Fords. Always active within the business and extremely popular with his fellow workers, he was also on the Executive Committee for the Social Club and one of the organisers for the 1921 picnic. His birthday on the 30th December is mentioned in the December 1922 issue of "The Echo". George became disgruntled with the apparent lack of further promotion and resigned in February 1923 forming his own Ford dealership Junction Motors Ltd. (later Mason Motors Ltd.) near the "Maid & Magpie" hotel at Kent Tce., Norwood. Mason was one of many dealerships interviewed when French arrived in January 1924 and continued to be highly critical of Duncan Motors Ltd. as the sole distributors were selling Ford cars both wholesale and retail effectively undermining his dealership. Mason Motors Ltd. outlasted both Duncan & Fraser Ltd. & Duncan Motors Ltd. by at least a decade. Mason, P. - listed in the August 1924 "The Echo". Whether he is related to George Mason (above) is not known. Massey, Miss - listed as a competitor in the 50 yds "Ladies' Championship" running race at the 1921 & 1922 picnics. Matthews, L.J. - listed as joining up to fight in the war. His position was kept open for his return. Mawdesly, Mrs. E. - listed as a competitor in the 50 yds "Waymouth Street Ladies' Championship" at the 1923 picnic. Her birthday is listed as 27th January in the January 1923 "The Echo". Mayo, W. - working in the Trim Shop he is listed as a competitor in the "21st February 1923 Flag Relay Race", "Three-legged Race" and other events at the 1923 picnic. Worked in the Trim Shop. Whether he is related to the famous Adelaide Mayo family is not known. Mays, Miss - listed as a competitor in the 50 yds "Ladies' Championship" running race at the 1921, 1922 & 1923 picnics. She shared her birthday on the 11th March with grandson Hugh Duncan. McBride, P. - his birthday on the 3rd November is mentioned in the December 1922 "The Echo". Whether he is related to R. McBride (below) is not known. McBride, R.H. - working in the office he is listed as a competitor in the "Relay Race", "Kicking For Goal" and partnered James Gilbraith in the "Men's Double Championship" tennis at the 1922 picnic. The next year he partnered I. Webber in the "Studebaker Gents Double" tennis & Miss Harris in the "Thornycroft Mixed Doubles" tennis at the 1923 picnic. He had a very busy day at the 1923 picnic! In January 1923 issue of the "The Echo" it makes mention of his promotion to the joining the Studebaker Sales Staff. Whether he is related to P. McBride (above) is not known. McCartin, Mrs. E. - her birthday is listed as 25th January in the January 1923 "The Echo". McClure, W - listed as part of the organising committee for the 1923 & 1924 picnics. McCormack, J. - listed as a competitor in the "Three-legged Race" at the 1923 picnic. McKenna, D. - listed as a competitor in the "Hanson Street Boot Race" at the 1923 picnic. Whether he is related to J. McKenna (below) is not known. McKenna, J. - joined the Sales Staff at Duncan & Fraser Ltd. selling Thornycroft Lorries in November 1922. Whether he is related to D. Mckenna (above) is not known. McKinley, A.J. - was an avid rower outside of work was part of the crew for the 1922 Henley-On-Torrens rowing team. Working as an oxy-welder in the Body Shop he is listed as a competitor in the "Three-legged Race", "Bowser Boat Race", "21st February 1923 Flag Relay Race" and other events at the 1922 & 1923 picnics. His birthday on 21st October is mentioned in the September 1923 "The Echo". McKinna (Jnr. ), J. - working in the Mill area he is listed as a competitor in the "Centipede Race" at the 1922 picnic. His birthday was the 12th March is listed in the February 1923 "The Echo". McKinna (Snr. ), J. - his birthday on the 15th October is listed in the September 1922 issue of "The Echo". McKirdy, J.D. - joined the company in the Costing Dept. in March 1924. McLaughlin, O. - working in the Motor Shop he is listed as a competitor in the "Three-legged Race", "Relay Race" and other events at the 1921 & 1922 picnics. McQueen, G.A. - his birthday is listed as 27th January in the January 1923 "The Echo". Meades, Miss - listed as a competitor in the 50 yds "Waymouth Street Ladies' Championship" at the 1923 picnic. Meecham, H.P. - Sales Manager as listed in the 1919 handbook, he was also part of the organising committee for the 1921 picnic. Meotti, John James - a painter by trade when he enlisted on 11th November 1916 to fight in the war. He was killed in action on 4th October 1917 fighting near Passchendaele, Belgium. Meyrick, A.C. - joined in 1913 when the company was publicly floated as Head of Publicity Department. Meyrick resigned his staff position in 1920 with the company putting on a farewell dinner held on 10th March at the Theater Royal Cafe. No mention is made as to where he was going or to what postion. Milane, G. - working in the Mill Section he is listed as a competitor in the "21st February 1923 Flag Relay Race" at the 1923 picnic. Millane, C. - working in the Mill area he is listed as a competitor in the "Three-legged Race", "Relay Race" and other events at the 1922 picnic. Whether he is related to G. Millane (below) is not known. Millane, G. - listed in the October 1924 "The Echo". His birthday was on the 11th November. Whether he is related to C. Millane (above) is not known. Millard, A. - listed as a competitor in the "Fordson High Jump", "Ford Sheffield Handicap" and other events at the 1921 picnic. Mills, H. - listed as a competitor in the "Light Square High Jump" and "21st February 1923 Flag Relay Race" and other events at the 1923 picnic. Worked in the Motor Shop. Milnes, John - working as a clerk when he enlisted on 30th August 1918 to fight in the war. He was killed in action on 3rd September 1916 around the village of Courcelette near Pozieres, France. Mitchell, C.J. - listed in the organising committee of the 1921 - 1924 picnics, he was promoted in October 1924 to the Sales Staff selling "renovated cars". Moodie, M. - listed in the April 1924 "The Echo". With such an unusual surname I think that he may be related to Miss Moodie (below). Moodie, Miss - listed as a competitor in the 50 yds "Ladies' Championship" running race at the 1922 & 1923 picnics. With such an unusual surname I think she may be related to M. Moodie (above). Moore, Frank C. - started as an apprentice trimmer in April 1918, Frank completed his apprenticeship in April 1923. Still working in the Trim Shop Frank is listed as a competitor in the "Three-legged Race", "Bowser Boat Race" and other events at the 1922 & 1923 picnics. He was also part of the organising committee for the 1923 and 1924 picnics. His birthday is listed as 24th February in the February 1924 "The Echo". Whether he is related to W. Moore (below) is not known. Moore, W.J. - listed as a competitor in the "Mile End Obstacle Race", "Light Square High Jump" and other events at the 1921 & 1923 picnics. Worked in the Sheet Metal Dept. His birthday was on the 22nd June. Whether he is related to F. Moore (above) is not known. Morcom, R.L.V. - from the Mill area, he is listed as a competitor in the "Three-legged Race", "Bowser Boat Race" and other events at the 1922 picnic. His birthday was on the 3rd March. Mordaunt, J.R. - his birthday on 19th October is mentioned in the September 1923 "The Echo". Morey, J. - his birthday on 12th June is mentioned in the May 1923 "The Echo". Mority, E. - his birthday on 12th February is mentioned in the January 1923 "The Echo". Moritz, Edward "Ned" - listed as a competitor in the "Three-legged Race" at the 1922 & 1923 picnics, but Ned is mentioned a little later as building the jigs for the Body Department after the fire in 1923. His birthday wa son the 12th February. Morony, J. - his birthday on 19th October is mentioned in the September 1923 "The Echo". Morris, E.C. - listed on the organising committee for the 1924 picnic. We also know that his birthday was on 21st November. Mulcahy, M.C. - his birthday on 24th October is mentioned in the September 1923 "The Echo". Mummie, H.G. - working in the Body Shop he is listed as a competitor in the "Relay Race", "Associated Companies' Championship" running race and other events at the 1921, 1922 & 1923 picnics. Munn, N.L.S. - joined Duncan Motors Ltd. on the Accessory Selling Staff in March 1923. He partnered C. Johns in the "Studebaker Gents Double" tennis and competed in the "21st February 1923 Flag Relay Race" at the 1923 picnic. He worked in the Stores and we also know his birthday was on the 30th November. Nancarrow, J.F. - working in the offices he is listed as a competitor in "Kicking For Goal" and "Centipede Race" at the 1921 picnic. In the "Mile-End Obstacle Race" and partnered G. Rogers in the "Studebaker Gents Double" tennis and competed in the "21st February 1923 Flag Relay Race" at the 1923 picnic. His birthday on 24th December is mentioned in the December 1923 "The Echo". Nelson, F. - whether his any relation to J. Nelson (below) or K. Nelson (below) is not known, but F. Nelson is listed as a competitor in the "Fordson High Jump", Three-legged Race" and other events at the 1922 picnic. Nelson, J. - listed in the organisers and competing in some events at the 1921 - 1924 picnics. In the September 1922 "The Echo" he is listed as the editor of the magazine donating a fine article on the ship "Star of Greece". whether he is related to F. Nelson (above) or K. Nelson (below) is not known. Nelson, K. - listed as a competitor in the "Hanson Street Boot Race", "Three-legged Race" and other events at the 1923 picnic. Whether he is related to F. Nelson (above) or J. Nelson (above) is not known. Nesbit, A.E. - his birthday on the 1st December is mentioned in the December 1923 "The Echo". Nettell, C.E. - originally from Angaston, he was already working for the business when he transferred in late 1921 to Duncan Motors Ltd. selling Fords. In 1923 he set the company record with 269 Ford cars sold in the calendar year. He is also listed on the organising committee for the 1923 & 1924 picnics. Nettleton, J.H. - working in the Body Shop he is listed as a competitor in the "Mile-End Obstacle Race", "Hanson Street Boot Race" and other events at the 1923 picnic. His birthday on the 3rd January is mentioned in the December 1922 issue of "The Echo". Newell, E.J. - working in the Stores he is listed in the organising committee and as a competitor in the "Bowser Boat Race", "Centipede Race" and other events at the 1921, 1922 & 1923 picnics. Whether he related to Richard Newell is not known. He was also part of the organising committee for the 1923 & 1924 picnics. Partnering Miss Rath at the 1924 picnic they won the Mixed Doubles Tennis Tournament. His birthday was on the 16th September. Newell, H. - whether he is related to Richard Newell is not known, but a H. Newell is listed as a competitor in the "Bowser Boat Race" at the 1921 & 1922 picnics. Nice, F.C. - partnered C. Bradley in the "Studebaker Gents Double" tennis and on the organising committee for the 1923 picnic. Whether he is related to P. Nice (below) is not known. Nice, P.E. - partnered Miss Ross in the "Thornycroft Mixed Doubles" tennis at the 1923 picnic. Whether he is related to F. Nice (above) is not known. Nicholas, R. - listed as a competitor in the "Kicking For Goal" at the 1922 picnic. His birthday on the 25th December is mentioned in the December 1922 "The Echo". Nichollis, Don - listed as the Paint Shop foreman at the time of the fire in 1923. Nicholls, G.D. - he is also listed as a competitor in the "Three-legged Race", "Bowser Boat Race" and other events at the 1921 & 1922 picnics and was also part of the organising committee for the 1923 & 1924 picnics. His birthday was on the 18th November. Whether he is related to P. Nicholls (below) or W. Nicholls (below) is not known. Nicholls, P. - whether he is related to G.D. Nicholls (above) or W. Nicholls (below) is not known, but he is also listed as a competitor in the "Three-legged Race", "Bowser Boat Race" and other events at the 1921 & 1922 picnics. He worked in the Motor Shop. Nicholls, W.P. - commenced work with Duncan & Fraser Ltd. in January 1918 as an apprentice Motor Mechanic. In December 1922 "The Echo" makes mention of him securing his Tradesmen's Certificate. He is also listed as a competitor in the "21st February 1923 Flag Relay Race" at the 1923 picnic. In late July 1924 he accompanied Lord & Lady Stradbroke, Governor of Victoria, on a 9 week tour of Central Australia and Northern Queensland with 4 Ford cars supplied by Duncan Motors Ltd. supporting the trip. Whether he is related to G.D. Nicholls or P. Nicholls (above) is not known. Nicholson, C.B. - working as the Sales Manager, he resigned from Duncan & Fraser Ltd. at the end of July 1922. Hugh Duncan took on the role until his successor, Reece Price could start work. Nixon, C.T. - listed in the Office Team for the "Centipede Race" at the 1921 picnic, he was working as a clerk to Fred Hopkins in the trim shop at the time of the fire in 1923. His birthday on 19th December is mentioned in the December 1924 "The Echo". Noble, A. - listed as a competitor in the "Three-legged Race", "Bowser Boat Race", "Fifty-Nine Three-legged Race" and other events at the 1921, 1922 & 1923 picnics. He worked in the Trim Shop and his birthday on 13th December is mentioned in the December 1924 "The Echo". Whether he is related to the other Noble's listed below is not known. Noble, E. - listed as a competitor in the "Three-legged Race" at the 1921 picnic. Whether he is related to the other Noble's listed above or below is not known. Noble, F. - listed as a competitor in the "Bowser Boat Race" and other events at the 1921, 1922 & 1923 picnics. Whether he is related to the other Noble's listed above or below is not known. Noble, H.N. - his birthday on the 13th December is mentioned in the December 1923 "The Echo". Whether he is related to the other Noble's listed above or below is not known. Noble, W. - listed as a competitor in the "Kicking For Goal" at the 1922 picnic. Whether he is related to the other Noble's listed above or below is not known. Noel, J. - listed as a competitor in the "Three-legged Race", "Bowser Boat Race" and other events at the 1921 - 1923 picnics. He worked in the Stores and his birthday was on the 27th February. Whether he is related to L. Noel (below) or T. Noel (below) is not known. Noel, L. - whether her is any relation to J. Noel (above) or T. Noel (below) is not known, but L. Noel is listed as a competitor in the "Fordson High Jump", "Three-legged Race" and other events at the 1922 picnic. Noel, T. - listed as a competitor in the "Centipede Race" at the 1922 picnic. Whether he is related to J. Noel (above) and L. Noel (above) is not known. Noll, J. - listed as a competitor in the "Three-legged Race" at the 1921 picnic. Noye, H.F. - from the Mill area he is listed as a competitor in the "Three-legged Race", "Bowser Boat Race" and other events at the 1922 picnic. His birthday is listed as 2nd September in the September 1922 "The Echo". Oakey, W. - his birthday on 20th December is mentioned in the December 1923 "The Echo". Oaten, Fred F. - working in the Body Shop he is listed as a competitor in the "Fordson High Jump", "Three-legged Race" and other events at the 1921 - 1924 picnics. Fred was also a league footballer playing for West Torrens and was part of the 1924 premiership side defeating Sturt at the Adelaide Oval in the Grand Final 9.12.66 points to 8.10.58 points. For the record this was West Torrens' first premiership. O'Brien, R. - working in the Body Shop trimming bodies he is listed as a competitor in the "Relay Race" and "Centipede Race" at the 1921 picnic. O'Donahue, J. - listed as a competitor in the "Three-legged Race", Bowser Boot Race" and other events at the 1921 picnic. Worked in the Stores. Officen, C. - listed as a competitor in the "Mile End Obstacle Race", "Hanson Street Boot Race" and other events at the 1923 picnic. Osborn, Stanley Reginald - working as a clerk when he enlisted on 26th November 1914 to fight in the war. He went on to be awarded the French Medal of Honour (Bronze) and the Military Medal. His position was kept open for his return. Oughton, H.L. - his birthday on 24th December is mentioned in the December 1924 "The Echo". Outten, A.M. - listed as a competitor in the "Bowser Boot Race" at the 1921 picnic. He was on the organising committee for the 1923 & 1924 picnics. Parkin, Mr. - joined the company in July 1922 as a Travelling Salesman. Palm, Miss E. - listed as a competitor in the 50 yds "Waymouth Street Ladies' Championship" at the 1923 picnic. Park, W.L. - joined Duncan Motors Ltd. as a Ford Salesman in March 1924. Parlor, W. - partnered Miss Baseby in the "Thornycroft Mixed Doubles" and Eric Bond in the "Studebaker Gents Double" tennis at the 1923 picnic. Parnell, Edmund - joined Duncan & Fraser Ltd. around 1917. After 15 years with the company he became ill. Edmund's step son Fred Voysey also worked for the company in the Sales Department. Edmund died on 27th December 1922. Pascoe, R.P. - listed as a competitor in the "Mile-End Obstacle Race", "Hanson Street Boot Race" and other events at the 1923 picnic. His birthday on 3rd October is mentioned in the September 1923 "The Echo". Pash, S.M. - his birthday on 1st October is mentioned in the September 1923 "The Echo".Whether he is related to S.R. or T.R. Pash (below) is not known. Pash, S.R. - working in the Mill area he is listed as a competitor in the "21st February 1923 Flag Relay Race" and at the 1923 picnic. Whether he is related to S.M. Pash (above) or T.R. Pash (below) is not known. Pash, T.R. - listed as a competitor in the "Mile-End Obstacle Race", "Light Square High Jump" and other events at the 1923 picnic. Whether he is related to S.M. or S.R. Pash (above) is not known. Patterson, T.W. - working in the Garage he is listed as a competitor in the "Hanson Street Boot Race", "21st February 1923 Flag Relay Race", "Fifty-Nine Three-legged Race" and other events at the 1923 picnic. Pawelski, Francis Harold - was working as a driver when he enlisted on 18th December 1915 to fight in the war. His position was kept open when he returned to Australia on 20th May 1919. He is listed as a competitor in the "Mile End Obstacle Race", "Hanson Street Boot Race" and other events at the 1923 picnic. By the 1923 picnic program he is now working as an oxy-welder in the Body Shop. Paynter, L.L. - joined the Ford Sales Staff at Duncan Motors Ltd. in August 1924. Pearce, W.J. - his birthday on 13th June is mentioned in the May 1923 "The Echo". Pegler, H.M. - listed in the April 1924 "The Echo". Perkins, R.H. - listed as a competitor in the "Three-legged Race","Bowser Boat Race" and other events at the 1922 & 1923 picnics. He worked in the Offices and his birthday was on the 4th March. Perriam, H.N. - joined the staff of Duncan & Fraser Ltd. on 1st December 1913. "...and received a particularly warm welcome, as the thermometer registered 109 degrees in the shade, and it was necessary that night to work until 10 pm upstairs in the Motor Shop Office, which was at the time just at the top of the stairs which eventually became the Drawing Office. Initially engaged in office work for a fortnight, he worked continuously with the Ford and stayed with the firm until their closure in August 1927. By April 1919 he was Head of the Costing Department. Perriam was appointed Company Secretary after Fred Mann resigned in 1920, but in November 1922 H.J. Byrne was recruited to this postion enabling Perriam to concentrate on the commercial side of the business. He was also part of the organising committee for the 1921, 1922 & 1923 picnics. Interesting to note that in 1913 "...it was considered a good days work to deliver three of four cars, but on 30th November 1923, the Company delivered 24 new Ford cars and trucks, two second hand cars and one new Fordson tractor, which is a record in any one day." Perriam was fond of gardening, music and choir work, but watching cricket at Adelaide Oval seems to of been a passion. Perriam is remembered for being very well liked as he always approachable and knowledgeable is his work. With such an unusual surname I as assuming that he is probably related to P.G. Perriam (below). Perriam, P.G. - listed as part of the organising committee and as a competitor in the "Fifty-Nine Three-legged Race" and other events at the 1923 & 1924 picnics. With such an unusual surname I as assuming that he is probably related to H.N. Perriam (above). Peters O.B.E., Captain Gordon - joined Duncan & Fraser in 1913 as a clerk entering job cards in the Motor Office. In 1915 he enlisted with the commissioned rank of lieutenant. He disembarked Adelaide with the 9th Reinforcements to the 12th Battalion on the 15th December 1915. Gordon saw service in Egypt, Lemnos and France and was later transferred to Australian Corps Headquarters where he was mentioned in dispatches and later awarded an O.B.E. He survived the war and returned to Australia on the 19th April 1919. He joined the Staff of Duncan & Fraser Ltd. on 4th August 1919 in Howie Spafford's office. After six months in this role displaying exceptional organisational abilities Gordon was given charge of the Body Building Department in January 1920. After two very busy years Gordon was then transferred into the General Office in February 1922 costing bodies and truck trays. In October 1922 he was promoted once more to Control of the Ledgers. Gordon was also on the Executive Committee of the Social Club in 1921-24 and competed in the "21st February 1923 Flag Relay Race" at the 1923 picnic. Gordon was said to be of a bright, sunny disposition, good natured and highly respected by every member of the staff and employees that he worked with. Peterson, Frank W. - joined Duncan & Fraser at the age of 14 as an apprentice in 1925. Originally from Port Pirie and "...just about had to beg for the time off..." to join his father in his 1923 Ford who was driving to Port Pirie for 50th Anniversary "Back to Pirie" celeberations in 1926. Pethick, N. - working in the Motor Shop he is listed as a competitor in the "21st February 1923 Flag Relay Race", "North Adelaide Centipede Race" and other events at the 1923 picnic. Pettitt, G.C. - joined the Ford Sales Staff at Duncan Motors Ltd. in October 1924. Philipson, J. - joined the company just before the fire in February 1923. He was the son of the late Mr. T. Phillipson who served with Duncan & Fraser for many years. He is listed as being part of the organising committee for the 1923 picnic, and was a clerk to Mr. Robertson at the time of the fire in 1923. His birthday was listed as the 12th December in the December 1923 issue of "The Echo". Phillipson, T. - was already deceased when his son is mentioned in the April 1923 "The Echo". Mr. Phillipson served with Duncan & Fraser for many years. Phillips, E.S. - listed in the August 1924 "The Echo". Whether he is related to Mrs. Phillips (below) is not known. Phillips, Mrs. O.A. - her birthday on 14th December is mentioned in the December 1923 "The Echo". Whether she is related to E. Phillips (above) is not known. Pile, H. - his birthday on the 14th January is mentioned in the December 1922 "The Echo". Piper, Mr. - listed as being the Accessory & Spare Parts Manager at the time of the fire in 1923. Pitarc, John Phillip - joined up on 11th November 1915 to fight in the war. His position was kept open when he returned wounded to Australia on 22nd July 1917. John was fit enough to take up his position and was listed as a competitor in the "Mile-End Obstacle Race" and other events at the 1921 & 1923 picnics. Pittman, S.J. - working in the Stores he is listed as a competitor in the "Three-legged Race" at the 1921 & 1922 picnics. Pitman, S.R. - working in Body Shop trimming bodies he is listed as part of the organising committee for the 1921 picnic. He was also involved as a competitor in the "Bowser Boat Race","Relay Race" and other events at the 1921 & 1922 picnics. Plimmer, F.N. - working in the Sheet Metal Dept. he is listed as a competitor in the "21st February 1923 Flag Relay Race", "Mile End Obstacle Race", "Hanson Street Boot Race" and other events at the 1923 picnic. Point, M. - representing the Motor Shop he is listed as a competitor in the "Relay Race", "Kicking For Goal" and other events at the 1921 & 1922 picnics. He was promoted to Ford Salesman selling Ford cars in September 1922. Pope, H.W. - listed on the Executive Committee of the Social Club from 1921 - 1924, he also played tennis partnering Mrs. Goldsack in the "Ladies' & Gents Doubles Championship" at the 1922 picnic. He was the Accessory & Spare Parts Manager at the time of the fire in 1923. Pope, Miss E. - working in the Costing office she is listed as a competitor in the 50 yds "Ladies' Championship" running race at the 1921, 1922 & 1923 picnics. Porter, E.L. - listed in the October 1924 "The Echo". Porteous, J.G. - listed as a competitor in the "Hanson Street Boot Race" at the 1923 picnic. His birthday is listed as 21st February in the February 1924 "The Echo". Potter, Miss - listed as a competitor in the 50 yds "Waymouth Street Ladies' Championship" at the 1923 picnic. Whether she is related to R. Potter, T. Potter or W. Potter (below) is not known. Potter, R. - joined the Studebaker Sales Staff at Duncan & Fraser Ltd. in October 1924. Whether he is related to Miss Potter (above) or T. Potter & W. Potter (below) is not known. Potter, T. - working in the Stores he is listed as a competitor in the "Relay Race", "Kicking For Goal" and other events at the 1921 picnic. Whether he is related to Miss Potter & E. Potter (above) or W. Potter (below) is not known. Potter, W.E. - also working in the Stores he is listed as a competitor in the "Bowser Boat Race", "Relay Race" and other events at the 1921 & 1922 picnics. He also partnered P. Callier in the "Studebaker Gents Double" tennis at the 1923 picnic. His birthday was on the 1st June. Whether he is related to Miss Potter, R. Potter or T. Potter (above) is not known. Powell, S. - his birthday is listed as 28th February in the February 1924 "The Echo". Power, William - was working with horses when he enlisted in 19th July 1915 to fight in the war. His position was kept open when he returned wounded to Australia on 9th February 1916. Whether William was fit enough to take up his position is not known. Preece, G. - listed in the April 1924 "The Echo". Prettyjohn, R.W. - joined Duncan Motors Ltd. selling Ford cars in September 1923. He is listed on the organising committee for the 1924 picnic. Price, H.C. - working in the Mill area he is listed as a competitor in the "Mile End Obstacle Race", "21st February 1923 Flag Relay Race" and other events at the 1922 & 1923 picnics. Whether he is related to Reece Price (below) is not known. Price, Reece - joined the company on 1st September 1922 as the Sales Manager for Duncan Motors Ltd. Reece is listed on the Executive Committee of the Social Club in 1922. Whether he is related to H.C. Price (above) is not known. Prosser, R. - listed as a competitor in the "Fordson High Jump", "Bowser Boot Race" and other events at the 1921 picnic. Pyatt, J. - his birthday on 12th February is mentioned in the January 1923 "The Echo". Ralph, B. - joined up to fight in the war. His position was kept open for his return. Ransford, Conrad Maurice - employed as a driver when he enlisted 21st September 1914 to fight in the war. His position was kept open when he returned to Australia on 2nd January 1919. Rath, Miss R. - joined the Office Staff at Duncan & Fraser Ltd. in November 1922 filling Miss M.P. Campbell's vacancy. Ray, W. - his birthday on 22nd December is mentioned in the December 1923 "The Echo". Raymond, F. - his birthday on 11th December is mentioned in the November 1924 "The Echo". It is assumed that it is his twin brother (below) as they share the same birthday. Raymond, H. - his birthday on 11th December is mentioned in the November 1924 "The Echo". It is assumed that it is his twin brother (above) as they share the same birthday. Rauth, O. - partnered Fred Wigg in the "Studebaker Gents Double" tennis at the 1923 picnic. His birthday was on the 27th February. Rechner, E. - left his dealership in Kadina to be appointed Ford Sales Manager at Duncan Motors Ltd. in January 1923. As Ford Sales Manager he was involved in the disastrous meetings with French in 1924. Unfortunately French took an instant dislike to Rechner and the Duncan brothers. Rechner was there at the end and was made redundant in August 1927 when the business ceased trading. Reid, A. - joined the Studebaker Sales Staff at Duncan & Fraser Ltd. in October 1924. Whether he is related to H. Reid or Miss Reid (below) is not known. Reid, Hugh - listed as Ford salesman in the 1919 handbook, but had been with the company for many years prior to this. When Duncan Motors Ltd. was formed in October 1920 Hugh stayed with Duncan & Fraser Ltd selling the other makes of cars. Hugh was also on the organising committee for the 1921 & 1922 picnics. Hugh resigned on 15th December 1922 but the notation in "The Echo" does not make mention of which company he was going to. Whether he is related to A. Reid (above) or Miss Reid (below) is not known. Reid, Miss J. - listed in the April 1924 "The Echo". She was one of the winners in the "Ladies' Flag Relay Race" at the 1924 picnic. Whether she is related to A. Reid or H. Reid (above) is not known. Reilly, William Leslie - was working as a motor mechanic when he enlisted on 2nd October 1916 to fight in the war. His position was kept open when he returned to Australia on 6th September 1919. Reusch, A.E. - his birthday on 1st December is mentioned in the December 1923 & November 1924 "The Echo". Reynolds, George M. - working in the Garage he is listed as a competitor in the "Hanson Street Boot Race", "21st February 1923 Flag Relay Race" and other events at the 1923 picnic. He became a father again on 18th October 1924 just missing his birthday on 14th October. Rice, L.R. - listed as a competitor in the "Bowser Boot Race" at the 1921 picnic, he was promoted the Costing Dept. in March 1924. His birthday on 17th February is mentioned in the February 1923 "The Echo". Richards, R. - his birthday on 27th November is mentioned in the November 1924 "The Echo". It is not known if he is related to another prominent Adelaide coach building firm of T.J. Richards & Sons Ltd.
Richmond, W. Keith - listed as a competitor in the "Three-legged Race", "Bowser Boat Race" and other events at the 1922 picnic. In the December 1923 issue of "The Echo" it makes mention "...is producing good results with a very good percentage of points passing first class. Good luck Keith, we are pleased to see you are getting along satisfactorily." His birthday is listed as 31st January in the January 1923 "The Echo". Ridney, E. - mentioned in the January 1923 issue of "The Echo" as returning back to work after a short illness. Rigney, E.J. - working in the Stores he is listed as a competitor in the "Three-legged Race", "Bowser Boat Race" and other events at the 1921 & 1922 picnics. He also competed in the "21st February 1923 Flag Relay Race" at the 1923 picnic. His birthday was the 11th September. Riley, V. - listed as a competitor in the "Three-legged Race" and other events at the 1921 picnic. Rinder, George - working as a Travelling Salesman and resigned from Duncan & Fraser Ltd. in July 1922. Rippin, D.J. - he joined the Duncan Motors Ltd. selling Ford cars in September 1922. Ritchie, Miss - partnered J. Gilbraith in the "Thornycroft Mixed Doubles" tennis and competed in the 50 yds "Waymouth Street Ladies' Championship" at the 1923 picnic. She was also on the organising committee for the 1924 picnic. Partnering Mrs. Goldsack at the 1924 picnic they won the Ladies Doubles Tennis Tournament. Roach, Frank John - was working as a labourer when he enlisted on 24th January 1917 to fight in the war. He was awarded the Military Medal for his actions on the night of 1st / 2nd March 1918 at Hollebeke, near Ypres, Belgium. His position was kept open when he returned to Australia on 17th March 1919. Whether he is related to T. Roach (below) is not known. Roach, T. - his birthday on 12th December is mentioned in the December 1923 & December 1924 "The Echo". Whether he is related to Frank Roach (above) is not known. Robertson, D. - listed as a competitor in the "Kicking For Goal" at the 1922 picnic. He also partnered G. Fidge in the "Studebaker Gents Double" tennis at the 1923 picnic. His actual position was the Mill Foreman at the time of the fire in 1923. His birthday on 25th December is mentioned in the December 1924 "The Echo". Robin, Nurse - this new position was created within the company in October 1924. Her job was to attend the factory on a daily basis so that any employee and their families could seek medical advice and assistance. Her duties also included visiting employees that were sick or injured and could not attend work. All costs for her work were paid for by the company with no employee or staff member paying any expenses from their own wages. Roe, H.R. - listed in the August 1924 "The Echo". Rogers, B. - listed as a competitor in the "Three-legged Race"and "Bowser Boat Race" at the 1921 & 1922 picnics. Whether he is related to G. Rogers (below) or Percy Rogers (below) is not known. Rogers, G.T - partnered J.F. Nancarrow in the "Studebaker Gents Double" tennis at the 1923 picnic. Whether he is related to B. Rogers (above) or Percy Rogers (below) is not known. Rogers, Percival Cyril - was working as a mechanic when he enlisted on 27th January 1916 to fight in the war.His position was kept open when he returned to Australia on 10th May 1919. He is listed as a competitor in the "Bowser Boot Race" and the "Centipede Race" at the 1921 picnic. It is not known if Percy is related to B. Rogers (above) or G. Rogers (above). Rose, L. - working in the Body Shop he is listed as a competitor in the 100 yds "Associated Companies' Championship", "Ford Sheffield Handicap" and other events at the 1921 & 1922 picnics. His birthday was the 23rd September. Rosenthal, M. - a former employee that left to manage his own Ford dealership in Renmark. The December 1922 issue of "The Echo" Robert Duncan makes mention of a trip to Sydney in his Ford staying overnight with their "mutual friend" and his car being secured at his dealership. That night Robert & his wife enjoyed dinner. The next morning Mr. Rosenthal had loaded the back seat with fresh oranges lasting most of the way to Sydney! Rooke, Miss G. - won the "guessing Competition" at the 1924 picnic. Ross, W.M. - accountant listed in the 1919 handbook, he was also part of the organising committee for the 1921 picnic. He resigned his staff position in September 1922 to take up the postion of Secretary & Accountant for H.C. Richards Ltd.
Routh, A. - partnered E. Wigg in the "Men's Doubles Championship" tennis at the 1922 picnic. Ross, Miss - partnered P.E. Nice in the "Thornycroft Mixed Doubles" tennis and competed in the 50 yds "Waymouth Street Ladies' Championship" at the 1923 picnic. Rowe, A.G. - listed in the August 1924 "The Echo". Rudland, A.E. - his birthday on 20th February is mentioned in the February 1923 "The Echo". Russ, Miss E. - listed as a competitor in the 50 yds "Ladies' Championship" running race at the 1921, 1922 & 1923 picnics. We also know her birthday was on the 8th December. Ryan, A.R. - his birthday is listed as 25th January in the January 1923 "The Echo". Salmon, R. - listed as a competitor in the "Three-legged Race", "Bowser Boat Race" and other events at the 1922 & 1923 picnics. His birthday on 25th December is mentioned in the December 1923 & December 1924 "The Echo". His son (below) also worked for the business. Salmon, R. Jnr. - the son of R. Salmon (above) his birthday on 4th September is mentioned in the September 1922 "The Echo". Sampson, A.E. - working at Duncan Motors Ltd. as a Salesman he is listed in the organising committee for the 1921 & 1922 picnics. His birthday was on the 11th November. Whether he is related to H.E. Sampson (below) is not known. Sampson, H.E. - listed on the organising committee for the 1921 picnic. Whether he is related to A.E. Sampson (above) is not known. Sams, W. - listed as a competitor in the "Hanson Street Boot Race" at the 1923 picnic. Sandow, Angus Gladstone Hamilton - was working as a mechanic when he enlisted on 2nd October 1916 to fight in the war. Surviving the war Angus was working in the office with Perriam at the time of the fire in 1923. He is listed as a competitor in the "Hanson Street Boot Race" at the 1923 picnic and by 1924 had volunteered for the Children's Committee for the 1924 picnic. His birthday was on the 15th September. Sands, W. - listed as a competitor in the "Fifty-Nine Three-legged Race" at the 1923 picnic. Sarich, Miss V. - one of the winners in the "Ladies' Flag Relay Race" and the "Egg & Spoon Race" at the 1924 picnic. Satterby, L. - working in the Garage he is listed as a competitor in the "Centipede Race" at the 1922 picnic. Satterly, S. - working in the Garage he is listed as a competitor in the "Three-legged Race", "Relay Race" and other events at the 1922 picnic. Saunders, C.W. - his birthday on 1st June is mentioned in the May 1923 "The Echo". Savage, H.N. - his birthday on 20th June is mentioned in the May 1923 "The Echo". Sawtell, C. - working in the Motor Shop he is listed as a competitor in the "Kicking For Goal" and in the "Centipede Race" at the 1921 picnic. His birthday was on the 18th October. Scanlon, W.T. - working in the Mill area he is listed as a competitor in the "Three-legged Race", "Centipede Race", "21st February 1923 Flag Relay Race" and other events at the 1922 & 1923 picnics. His birthday on the 15th December is mentioned in the December 1924 "The Echo". Schram, R. - listed as a competitor in the "Three-legged Race" at the 1921 picnic. Schultz, H.E. - working in the office his birthday was on the 28th October. He partnered Alan Duncan in the "Studebaker Gents Double" tennis and competed in the "21st February 1923 Flag Relay Race" at the 1923 picnic. The following year he again partnered Allan Duncan playing tennis at the 1924 picnic they won the Men's Double Tennis Tournament. Scougall, Alexander Stewart - was working as a wood machinist when he enlisted on 12th May 1915 to fight in the war. His position was kept open when he returned to Australia on 16th March 1919. We don't know what he did after his return from the war, but he was still with the company when his birthday on 2nd December was mentioned in the November 1924 issue of "The Echo". Sellars, Miss Marjorie - joined Duncan Motors Ltd. in the Ford Sales staff in March 1924. Selth, E.M. - was an apprentice with Fred Hercus at the time of the new factory in 1906. One of the three photographs taken by Fred Hercus is of Eddie Selth proudly standing by his lathe. Eddie is listed as a competitor in various events at the 1921 picnic and as playing tennis in the "Men's Double Championship" in the picnics of 1922. He was on the organising committee for the 1924 picnic. It is suspected that he left Duncan & Fraser to join Fred Hercus in his business. Shadgett, Alan George - a coach builder by trade, Alan enlisted on 28th July 1915 to fight in the war. He was killed in action on 2nd April 1917 near Baupaume, France. Sharland, Miss N.G. - listed as a competitor in the 50 yds "Ladies' Championship" running race at the 1922 & 1923 picnics. She was on the organising committee for the 1921 - 1924 picnics. Her birthday was on the 17th October. Sharp, E.J. - listed as a competitor in the "Three-legged Race" and other events at the 1921, 1922 & 1923 picnics. His birthday was on the 17th January. Sharples, J. - working in Sales he is listed as a competitor in the "Relay Race" at the 1922 picnic. Shaw, Douglas Levi - left Duncan & Fraser Ltd. to work for Holden Motor Bodies where he finished his working career. Shearing, Stanley Arthur Harry - was employed as a driver when he enlisted on 9th August 1915 to fight in the war. His position was kept open when he returned wounded to Australia on 31st August 1916. Whether Stanley was fit enough to take up his position is not known. Shepherdson, E. - working in the Body Shop he is listed as a competitor in the "21st February 1923 Flag Relay Race", "Fifty-Nine Three-legged Race" and other events at the 1923 picnic. Whether he is related to R. Shepherdson (below) is not known. Shepherdson, R. - listed as a competitor in the "Hanson Street Boot Race", "Fifty-Nine Three-legged Race" and other events at the 1923 picnic. Whether he is related to E. Shepherdson (above) is not known. Shortridge, Lindsay Gordon - was working as a mechanic when he enlisted on 31st May 1915 to fight in the war. He took up his position that was kept open when he returned to Australia on 26th July 1919. Later he is listed as a competitor in the "Three-legged Race", "Bowser Boat Race" and other events the 1921 & 1922 picnics. Simpson, Charles H.A. - joined the Staff at Duncan & Fraser Ltd. in charge of the Garage in September 1924. Sinclair, Harry Joseph - employed as a machinist when he enlisted on 3rd August 1915 to fight in the war. He died of his wounds sustained in battle north of the River Somme on 3rd September 1918 in France. Sinfield, C. - his birthday on 15th March is mentioned in the February 1923 "The Echo". Whether he is related to the Sinfields (below) is not known. Sinfield, L.C. - his birthday on 1st October is mentioned in the September 1923 "The Echo". Whether he is related to C. Sinfield (above) or W. Sinfield (below) is not known. Sinfield, W. - his birthday on 20th December is mentioned in the December 1924 "The Echo". Whether he is related to the Sinfields (above) is not known. Smelt, Charles Harold - working as a wood machinist when he enlisted on 2nd August 1915 to fight in the war. He was killed in action on 23rd August 1916 fighting at Monquet Farm, France. Smith, Albert J. "Bert" - started working at Duncan & Fraser Ltd. as a Ford car salesman around 1914. When the Duncan brothers annexed the Ford part of the business in October 1920. Bert continued his service with Duncan Motors Ltd. His birthday on the 11th January is mentioned in the December 1922 issue of "The Echo". Both Bert and his brother Mort (below) had seen an opportunity for an urban Ford dealer at Port Adelaide. By late 1922 both brothers had raised enough capital and resigned in early 1923 to form their own company The Smith Motor Co. servicing Ford products in Godfrey Street, Port Adelaide. The Smith Motor Company was another of the many dealerships interviewed when French arrived in January 1924 and were also critical of Duncan Motors Ltd. as the sole distributors were selling Ford cars both wholesale and retail effectively undermining their dealership. Smith, C.T. - working in the Sheet Metal Dept. and later in the Body Shop trimming bodies, he is listed as a competitor in the "Three-legged Race","Bowser Boat Race" and other events working at the 1921, 1922 & 1923 picnics. We also know his birthday was the 14th November. Smith, M.A. - not much is known about this chap other than being listed as joining up to fight in the war in the 1919 handbook. If he survived the war his was kept open for his return. He is no relation to the the Smith brothers (above). Smith, Morton S. "Mort"- brother of Bert (above), Mort was also already working at Duncan & Fraser Ltd. in the service department as a mechanic when the Duncan brothers annexed the Ford part of the business in October 1920. Teaming up with his brother they both resigned to form the Smith Motor Company in 1922. Mort sold his share of the business to his brother Bert in 1930's aligning the business with General Motors products. 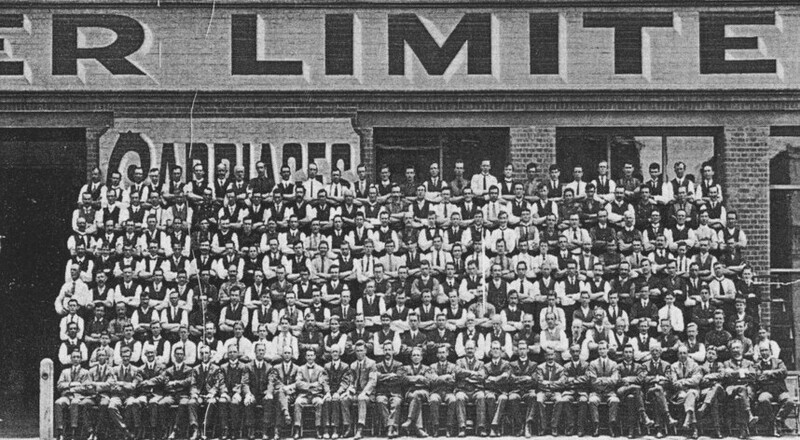 The Smith Motor Co. still trade today at Port Adelaide (suburb of Adelaide) outlasting Duncan & Fraser Ltd. by decades. Smith, S. - listed as a competitor in the "Hanson Street Boot Race", "Three-legged Race" and other events at the 1923 picnic. Smith, W.G. - listed as a competitor in the "Mile-End Obstacle Race", "Three-legged Race" and other events at the 1923 picnic. His birthday is listed as 25th January in the January 1923 "The Echo". Smith-Robertson, Alexander - was apprenticed as a coach builder in the late 1870's. In January 1881 under the guidance of senior Duncan & Fraser tradesman Mr. Craddock, Alex built a four-in-hand carriage for the Bowman family at Mintaro. During his apprenticeship Alex built a detailed model horse tram. He continued working on carriages and buggies, but by 1887 he was at Kilkenny building tram cars. What happened to Alex after this is not known. However, the model Alex made nearly 100 years ago survives today and is in the care of the South Australian National Trust. It has been used on numerous occasions to provide details to assist in the restoration of horse drawn trams. See SLSA B35661. Solomon, H.D. - listed as a competitor in the "Three-legged Race" at the 1923 picnic. Sommer, C. - working in the Motor Shop he is listed as a competitor in the "Centipede Race" at the 1922 picnic. Sorenson, A. - joined the Ford Sales Staff at Duncan Motors Ltd. in October 1924. Sorensen, C. - his birthday on the 28th February is mentioned in the February 1923 "The Echo". Spafford, Howsin Sells "Howie" - nephew of the Duncan brothers, Howie was born on 22nd December 1883 and commenced his body building apprenticeship with Duncan & Fraser in 1895 aged 12. He left in 1900 to gain manufacturing experience in Great Britain, Canada and America returning in 1909. The family story is that Howie had no intention of returning and was drafting a letter saying so when he spilled his coffee all over it; he saw this as fate and only then decided to return to Australia. His appointment as Works Manager in 1910 was seen by some at the time as nepotism and senior tram builder John Dunn resigned over it. By 1919 he was promoted to the grand title of "Master Mechanic, Production & Workshop Manager", basically "second in charge" after the Duncan brothers themselves. He was also on the Executive Committee of the Social Club for many years. Howie is personally responsible for integrating the latest manufacturing techniques in the new Ford "Duncan Motors" body released in July 1921 including welded panels. When the factory caught fire the caretaker rang Howie who in turn notified the Duncan family. After the fire Howie's exceptional management and organisational skills were on display as the company managed to trade by utilising buildings and work shops all over Adelaide. These lessons were fully integrated into the new "Duncan Buildings" that replaced the old factory destroyed by the fire. Howie was also integral in the design and organisation of the Ford assembly line at Mile End. In my opinion Howie was the drive behind the Duncan brothers, a fact supported by French after his trip to South Australia in January 1924. Although Howie was retrenched in 1927, his talents were immediately drafted to Ford Australia in Geelong as Master Mechanic. Retiring to Crystal Brook in the Flinders Ranges to be with his daughter, Howie passed away on 1st June 1970 aged 90. Sparks, Charles Reginald - working as a carriage trimmer when he enlisted on 18th July 1915 to fight in the war. He was killed in action on 7th October 1917 at Ypres, Belgium. Steele, Malcolm Neil T. - enlisted 6th July 1915 to fight in the war. His position was kept open when he returned to Australia on 9th July 1919. Stephens, T. - his birthday on 14th June is mentioned in the May 1923 "The Echo". Sterling, V.S. - joined the company in July 1922 as a Travelling Salesman. He is listed as a competitor in the "Fordson High Jump", "Relay Race" and other events at the 1922 picnic. In April 1923 he was transferred to selling Fordson Tractors. Stevens, G. - listed on the Executive Committee for the 1924 picnic. Whether he is related to J. Stevens (below) is not known. Stevens, J. - listed as a competitor in the "Bowser Boat Race" at the 1922 picnic. Whether he is related to G. Steven (above) is not known. Stewart, A.W. - working in the Mill Section he is listed as a competitor in the "Mile-End Obstacle Race", "Light Square High Jump" and other events at the 1921, 1922 & 1923 picnics. Whether he is related to H. or Mrs. Stewart (below) is not known. Stewart, H.W. - his birthday on the 13th December is mentioned in the December 1923 "The Echo". Whether he is related to A. Stewart (above) or Mrs. Stewart (below) is not known. Stewart, Mrs. L. - listed as a competitor in the 50 yds "Waymouth Street Ladies' Championship" at the 1923 picnic. Her birthday on the 14th January is mentioned in the December 1922 issue of "The Echo". Whether she is related to A.W. Stewart (above) is not known. Stilwell, S.W. - joined Duncan & Fraser Ltd. as a Studebaker Salesman on 16th December 1922. He is also listed on the organising committee for the 1923 picnic. His birthday was on the 18th October. Stone, C.R. - his birthday is listed as 20th February in the February 1924 "The Echo". Whether he is related to Miss Stone (below) is not known. Stone, Miss - listed as a competitor in the 50 yds "Ladies' Championship" running race at the 1921 picnic. Whether she is related to C. Stone (above) is not known. Strandley, D. - listed as a competitor in the 135 yds "Ford Sheffield Handicap" running race at the 1921 picnic. Strickland, W.T.T. - commenced working for Duncan & Fraser Ltd. around February 1921. His birthday on the 27th October is mentioned in the September 1922 "The Echo". Struthers, R. - his birthday on 21st December is mentioned in the December 1922 "The Echo". Sturm, L. - joined Duncan & Fraser Ltd. in January 1924 filling the postion vacated by F. Nancarrow. Styles, E. - working in the Motor Shop he is listed as a competitor in the "Relay Race" at the 1921 picnic. Sudlow, Jack - started as an apprentice Motor Mechanic in 1919. In the December 1922 "The Echo" Jack is mentioned "...best all-round student in his grade". In the December 1923 issue of "The Echo" it makes mention "Jack Sudlow is showing good progress. He passed first class and received first class certificate and first in the Chamber of Manufacturers Scholarship for Motor Mechanics. Congratulations, Jack." His birthday on 14th November is mentioned in the November 1924 "The Echo". Jack continued with his studies once his apprenticeship had ended and in the December 1924 "The Echo" again makes mention "... has continued his studies, after passing out of the apprentice class, passed with a credit in Mechanical Drawing". Symonds, Malcolm - listed on the organising committee for the 1924 picnic. Taffin, R. - his birthday on 28th December is mentioned in the December 1924 "The Echo". Talbot, T. - birthday listed at 23rd September in the September 1922 issue of "The Echo". Tamblyn, Louis Wendall - working as a bodybuilder when he enlisted on 20th January 1916 to fight in the war. He was discharged from the army on 19th June 1918. He returned to his position, competed in the "Kicking For Goal" at the 1922 picnic and was still working for Duncan & Fraser Ltd. at the time of the fire in 1923. Tapp, R.C. - listed as a competitor in the "Three-legged Race" at the 1921 & 1922 picnics. Worked in the Body Shop. His birthday was on the 5th November. Taylor, L.A. - his birthday on 15th March is mentioned in the February 1923 "The Echo". Tee, K. - listed as a competitor in the "Kicking For Goal" at the 1922 picnic. Theim, Alfred Ross - educated at St. Peter's College he joined in 1908 as an office clerk. Giving Duncan & Fraser 12 months notice he resigned in June 1913 to join his friend Johnnie Behrens and their business partnership of Behrens & Marshall. Theim, John Frederick- brought up on farming, John was already employed at Duncan & Fraser when his son Ross joined in 1908. When the Fordson tractor arrived in 1919 Duncan & Fraser Ltd. set up a new department to handle it. With a farming background John was made the Farm Implement Department Manager, a staff position he held until the firm's closure in 1927. In 1919 handbook John's assistant manager was Hugh Duncan. Ternan, A.D. - was already working in the Sales Department when he is mentioned as being married on the 6th September 1923. Prior to his wedding day he entertained the travellers and members of the Sales Staff at a smoke social on August 31st at the Aurora Hotel. Thomas, Miss D. - joined Duncan & Fraser Ltd. as a Switchboard Operator in March 1924. Thomson, J. - not much is known about this chap other than being listed as joining up to fight in the war in the 1919 handbook. If he survived the war his was kept open for his return. Thompson, C.R.C. - is listed as a competitor in the "Three-legged Race", "Bowser Boat Race" and other events at the 1921, 1922 & 1923 picnics. He worked in the Sheet Metal Dept. His birthday was on the 9th February. Whether he is related to L. Thompson or Miss Thompson (below) is not known. Thompson, L. - listed as working in the Mill area and as a competitor in the "Three-legged Race", "Bowser Boat Race" and other events at the 1922 picnic. We also know his birthday was on the 8th December. Whether he is related to C. Thompson (above) or Miss Thompson (below) is not known. Thompson, Miss - listed as a competitor in the 50 yds "Ladies' Championship" running race at the 1922 picnic. Whether she is related to C. Thompson or L. Thompson (above) is not known. Tonkin, H. - working in the Motor Shop he is listed as a competitor in the "21st February 1923 Flag Relay Race" at the 1923 picnic. "...although he has lost some of his robustness, he is of good cheer and quite happy in his toil." "...possessed a radiantly happy disposition, and a lovable temperament, and by his genial and sympathetic nature he won, during his 40 odd years he was associated with us, a host of friends who, upon hearing the sad news of his death, were deeply grieved". One of the great tradesman of the company was laid to rest in the West Terrace Cemetery, Adelaide. Thorpe, G. - joined Duncan & Fraser Ltd. in July 1922 as a Travelling Salesman. In September 1922 he was promoted to the Studebaker Selling Staff specialising in Studebaker "Light-Sixes". Timmell, F. - his birthday is listed as 21st January in the January 1923 "The Echo". Tolcher, A. - listed as part of the organising committees and as a competitor in the "Bowser Boat Race", "Ford Sheffield Handicap" and other events at the 1921 - 1924 picnics. Worked for the Motor Shop. His birthday was on the 2nd June. Tonkin, H. - listed as a competitor in the "Mile End Obstacle Race", "Hanson Street Boot Race" and other events at the 1923 picnic. Worked in the Motor Shop. Tornquist, J. - his birthday on 8th June is mentioned in the May 1923 "The Echo". Towhill, F. - working in the Mill area he is listed as a competitor in the "Centipede Race" at the 1922 picnic. Trevithic, S. - listed as a competitor in the "Kicking For Goal" at the 1922 picnic. Trevorrow, R. - commenced work with Duncan & Fraser Ltd. in January 1918 as an apprentice Motor Mechanic. In December 1922 "The Echo" makes mention of him securing his Tradesmen's Certificate.He is also listed as a competitor in the "Three-legged Race", "Bowser Boat Race" and other events at the 1921 - 1923 picnics. Truman, A.W. - his birthday on 14th March is mentioned in the February 1923 "The Echo". Tucker, L.R. - joined the Studebaker Sales Staff at Duncan & Fraser Ltd. in October 1924. Tuckey, A.E. - listed on the Executive Committee of the Social Club in 1921 - 1924, he is also listed as working in the Exhibition Buildings after the fire in 1923. His birthday was on the 11th November. Tuncks, Miss - listed as a competitor in the 50 yds "Ladies' Championship" running race at the 1921 picnic. Turner, H.T. - listed as part of the organising committee for the 1923 & 1924 picnics. He was promoted to Ford Salesman selling Ford cars in September 1922. Whether he is related to J. or Mrs. Turner (below) is not known. Turner, J. - his birthday on 10th October is mentioned in the September 1923 "The Echo". Whether he is related to H. Turner (above) or Mrs. Turner (below) os not known. Turner, Mrs. - her birthday on 20th February is mentioned in the February 1923 "The Echo". Whether she is related to H. or J. Turner above is not known. Vicary, A. - listed as a competitor in the 100 yds "Associated Companies' Championship", "Ford Sheffield Handicap" and other events at the 1923 picnic. Vince, E. - listed as a competitor in the "Bowser Boat Race", "Kicking Ford Goal" and other events at the 1921 & 1922 picnics. Vincent, A.J. - working in the Body Shop he is listed as a competitor in the "21st February 1923 Flag Relay Race" at the 1923 picnic. Voysey, Fred H. - birthday listed at 29th September in the September 1922 issue of "The Echo" and was the step son of Edmund Parnell. Waite, Clem - an apprentice body builder he is listed as a competitor in the "Fordson High Jump", "Bowser Boat Race" and other events at the 1922 picnic. His birthday on the 4th January is mentioned in the December 1922 issue of "The Echo". He completed his apprenticeship in January 1923. In the summer of 1921/22 Clem was the Australian Breast Stroke Champion. Whether he is related to F. Waite (below) is not known. Waite, F. - listed as a competitor in the "Kicking For Goal" at the 1922 picnic. Whether he is related to C. Waite (above) is not known. Wakelin, M. - working in the Motor Shop he is listed as a competitor in the "Three-legged Race" at the 1921 picnic. Walker, J. - working in the Body Shop he is listed as a competitor in the "Mile-End Obstacle Race" and partnered F. Wilson in the "Studebaker Gents Double" tennis and other events at the 1923 picnic. His birthday was on the 23rd June. Whether he is related to Miss Walker (below) is not known. Walker, Miss R.E. - listed as a competitor in the 50 yds "Ladies' Championship" running race at the 1921 - 1923 picnics. Her birthday was the 28th September. Whether she is related to J. Walker (above) is not known. Walsh, J. - listed as a competitor in the "Mile-End Obstacle Race", "Hanson Street Boot Race" and other events at the 1923 picnic. His birthday was on the 8th March. Walters, H.V.L. - listed as a competitor in the 100 yds "Duncan & Fraser Championship" running race at the 1921 picnic. Waltke, Harold William - was working as a blacksmith when he enlisted on 7th July 1915 to fight in the war. His position was kept open when he returned to Australia on 5th March 1919. Ward, C.T. - his birthday on 13th June is mentioned in the May 1923 "The Echo". Ware, S.N. - listed in the April 1924 "The Echo". Warner, H. - listed as a competitor in the "Mile End Obstacle Race", partnering Miss Crabbe in the "Thornycroft Mixed Doubles" and P. Cockrum in the "Studebaker Gents Double" tennis events at the 1923 picnic. Warren, W.G. - listed as a cashier in the 1919 handbook. He is also listed as being a member of the Executive Committee of the Social Club in 1921 - 1924 which he chaired in 1922. In December 1922 he was promoted to the postion of Assistant Secretary. Wastell, R. - listed as a competitor in the "Three-legged Race", "Bowser Boat Race", "21st February 1923 Flag Relay Race" and other events at the 1922 & 1923 picnics. Worked in the Motor Shop. Watt, D. - listed as a competitor in the "Mile End Obstacle Race", "21st February 1923 Flag Relay Race" and other events at the 1923 picnic. Worked in the Motor Shop. Wauchope, Miss J. - joined Duncan & Fraser Ltd. as a Switchboard Operator replacing Miss Goldring in March 1924. By December 1924 the switchboard was taking over 800 calls per day. Webber, I. - listed as a competitor in the "Ford Sheffield Handicap" running race at the 1922 picnic. He later partnered R. McBride in the "Studebaker Gents Double" tennis and competed in the "21st February 1923 Flag Relay Race" at the 1923 picnic. He worked in the offices. Whether he is related to J. Webber (below) is not known. Webber, J. - working in the Stores he listed as a competitor in the "Ladies'& Gents Doubles Championship" tennis partnering Miss E. Harris and as a competitor in the 100 yds "Associated Companies' Championship" running race at the 1921 & 1922 picnics. Whether he is related to I. Webber (above) is not known. Whitbread, C. - working in the Stores he is listed as a competitor in the "Three-legged Race", "Ford Sheffield Handicap" and other events at the 1921 picnic. White, A.W. - working in the Mill area he is listed as a competitor in the "Relay Race", "Kicking For Goal" and other events at the 1922 picnic. His birthday was on the 3rd February. Whether he is related to Fred White (below) is not known. White, Fred - working in the paint shop at the Exhibition Buildings at the time of the fire in 1923. Whether he is related to A. White (above) is not known. Whittney, F.J.C. - commenced work with Duncan & Fraser Ltd. in January 1918 as an apprentice Motor Mechanic. In December 1922 "The Echo" makes mention of him securing his Tradesmen's Certificate. he is also listed as a competitor in the "Three-legged Race", "Bowser Boat Race" and other events at the 1921 - 1923 picnics. Wiadrowski, A. - listed as a competitor in the "Hanson Street Boot Race", "Three-legged Race" and other events at the 1923 picnic. Wigg, Fred - partnered O. Rauth in the "Studebaker Gents Double" tennis at the 1923 picnic and listed as being on the Executive Committee for the Social Club in 1923 & 1924, he was actually the Van Section Foreman around the time of the fire in 1923. His birthday on 24th February is mentioned in the February 1923 "The Echo". Wilkins, G. - listed as a competitor in the "Mile End Obstacle Race", "Hanson Street Boot Race", "Studebaker Gents Double" tennis and other events at the 1923 picnic. He worked in the Offices. Williams, Charles James - was working as a driver when he enlisted on 27th March 1915 to fight in the war. His position was kept open when he returned wounded to Australia on 29th May 1917. Whether Charles was fit enough to take up his position or is related to J. Williams, L. Williams or Miss Williams (below) is not known. Williams, J.H. - working in the Motor Shop he is listed as a competitor in the "Mile-End Obstacle Race", "Hanson Street Boot Race" and other events at the 1923 picnic. His birthday was the 1st October. Whether he is related to Charles Williams (above) or L. Williams, Miss Williams or Mrs. Williams (below) is not known. Williams, L. - working in the Mill area he is listed as a competitor in the "Centipede Race" at the 1922 picnic. Whether he is related to Charles Williams (above), J. Williams (above) or Miss Williams (below) is not known. Williams, Miss T.M. - listed as a competitor in the 50 yds "Ladies' Championship" running race at the 1922 & 1923 picnics. her birthday wa son the 12th September. Whether she is related to Charles Williams, J. Williams, L. Williams and Miss Williams (above) or Mrs. Williams (below) is not known. Williams, Mrs. - listed as a competitor in the 50 yds "Waymouth Street Ladies' Championship" at the 1923 picnic. Whether she is related to any of the Williams (above) is not known. Williams, S.F. - his birthday on 22nd February is mentioned in the February 1923 "The Echo". Whether he is related to any of the Williams (above) is not known. Williamson, W.C. - listed in the September& October 1924 "The Echo". His birthday was the 7th October. Wilson, A. - listed in the August 1924 "The Echo". Whether he is related to F. Wilson, G. Wilson or H. Wilson (below) is not known. Wilson, F. - working in the Body Shop he is listed as a competitor in the "Mile End Obstacle Race", "Hanson Street Boot Race" and other events at the 1923 picnic. Whether he is related to A. Wilson (above) or G. Wilson & H. Wilson (below) is not known. Wilson, G. - not much is known about this chap other than being listed as joining up to fight in he war in the 1919 handbook. If he survived the war his was kept open for his return. Whether he is related to A. Wilson & F. Wilson (above) or H. Wilson (below) is not known. Wilson, H.H. - joined Duncan Motors Ltd. as a Ford Salesman in March 1924. Whether he is related to A. Wilson, F. Wilson & G. Wilson (above) is not known. Withey, W. - listed as a competitor in the "Three-legged Race", "Associated Companies' Championship" and other events at the 1922 picnic. Wolfman, H.L. - joined Duncan & Fraser Ltd. replacing Will Fagan in the Advertising & Publicity Department in September 1923. He is listed in August 1924 as Editor of "The Echo" and working in the Advertising Dept. Wood, C.R. - commenced work with Duncan & Fraser Ltd. in January 1918 as an apprentice Motor Mechanic. In December 1922 "The Echo" makes mention of him securing his Tradesmen's Certificate. He is also listed as a competitor in the "Fordson High Jump", "Three-legged Race" and other events at the 1921 - 1923 picnics.His birthday was on the 27th June. Wood, M.R. - listed as a competitor in the "Kicking For Goal" at the 1921 picnic. Wright, B. - listed as a competitor in the "Fifty-Nine Three-legged Race" at the 1923 picnic. Whether he is related to K. Wright, N. Wright, P. Wright or W. Wright (below) is not known. Wright, K. - listed as a competitor in the 135 yds "Ford Sheffield Handicap" running race at the 1921 picnic. Whether he is related to B. Wright (above) or N. Wright, P. Wright or W. Wright (below) is not known. Wright, N. - listed as a competitor in the "Three-legged Race" and representing the Motor Shop in the "Relay Race" at the 1922 picnic. Whether he is related to B. Wright or K. Wright (above), P. Wright or W. Wright (below) is not known. Wright, P. - listed as a competitor in the "Mile-End Obstacle Race", "Hanson Street Boot Race" and other events at the 1923 picnic. Whether he is related to B. Wright, K. Wright or N. Wright (above) or W. Wright (below) is not known. Wright, Walter - was working as a factory hand when he enlisted on 17th January 1916 to fight in the war. His position was kept open when he returned wounded to Australia on 4th May 1917. Wally was fit enough to take up his position and was listed as a competitor in the "Fordson High Jump", "Three-legged Race" and other events at the 1921 - 1923 picnics. By the 1923 picnic he is listed as working in the Motor Shop. His birthday was the 24th September. Whether he is related to B. Wright, K. Wright, N. Wright or P. Wright (above) is not known. Wylie, James - joined as a 1st year apprentice coach painter in 1865 under James Fraser and was the partnership's second employee, Richard Newell was the first with the third year of his apprenticeship taking seniority. Wylie stayed with the business for his entire working career retiring around 1918 on full wages. He was also well liked and respected by his peers being fondly remembered as an exceptional tradesman. Wylie, H.J. - Factory Foreman in the 1919 handbook. It is thought that he is related to James Wylie, possibly his son. Another gifted tradesman, in 1916 he invented a retreading and beading machine for tyres with the help of Hugh Duncan. Yates, F.W. - his birthday on the 11th December is mentioned in the December 1923 & November 1924 "The Echo". Young, A.D. - was a Company Director without what seems to be any portfolio when his name first appears on the company documents when it is publicly listed in June 1913. He was on the organising committee for the 1921 - 1924 picnics. His birthday on 31st December is mentioned in the December 1924 "The Echo". He was retrenched when the business closed in August 1927.